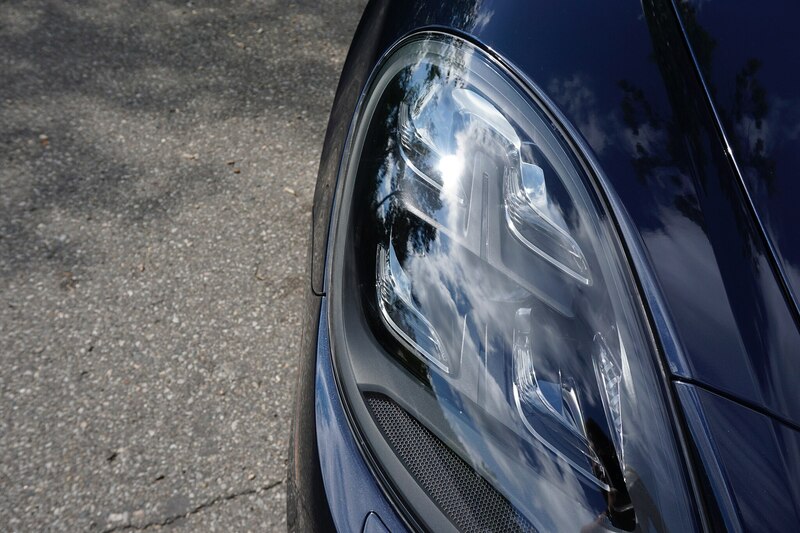 It was a look of pure envy. 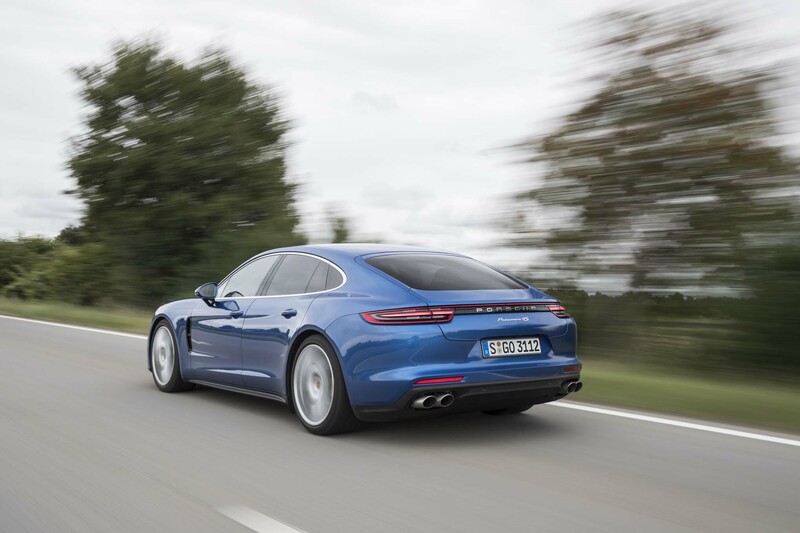 The French-cuffed driver of a last-generation Porsche Panamera 4S pulled up next to me, giving me the old up-and-down from the adjacent freeway lane. 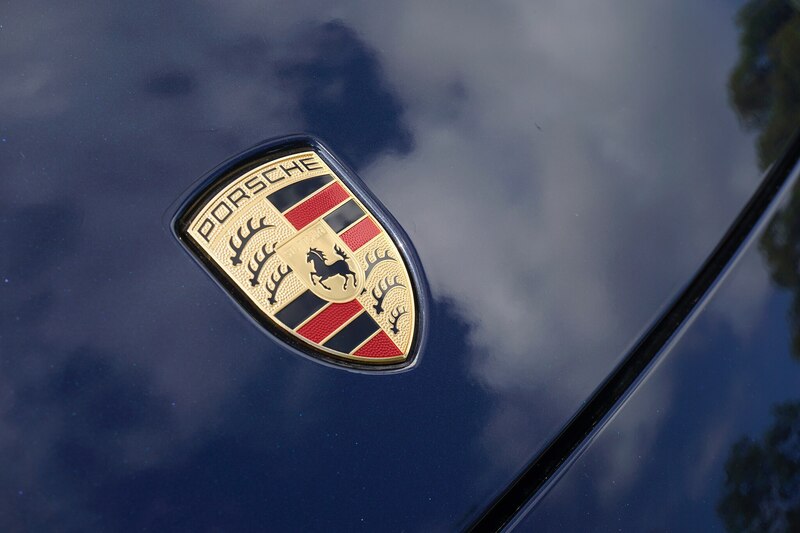 He grinded his teeth. 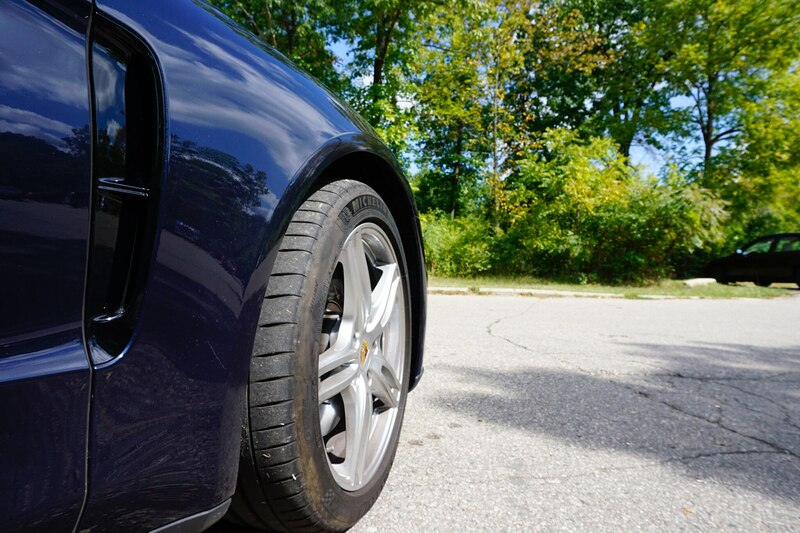 Foot to the floor, he sped off. 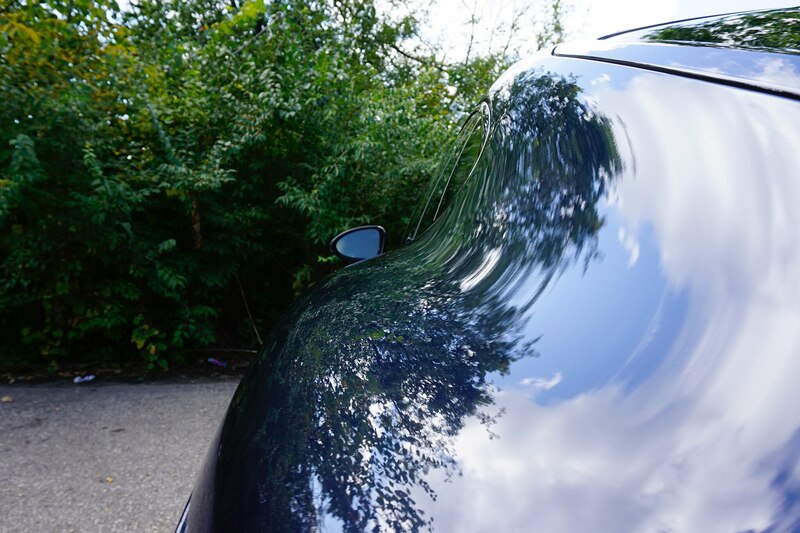 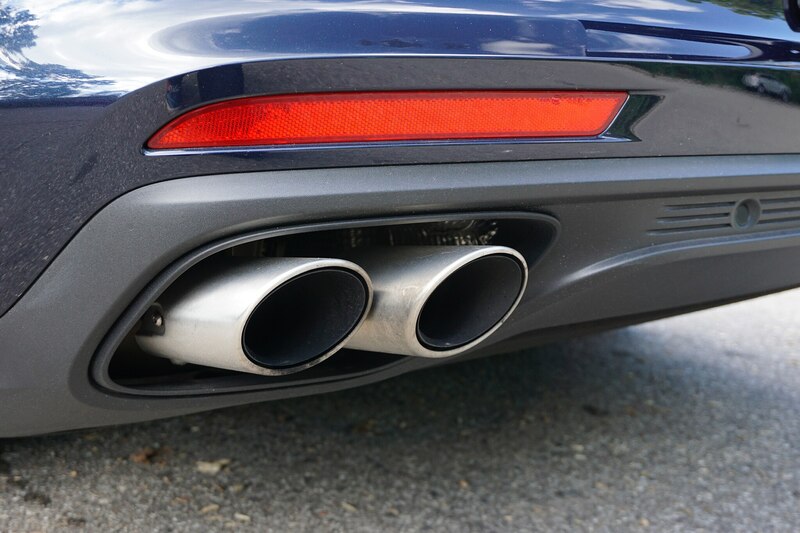 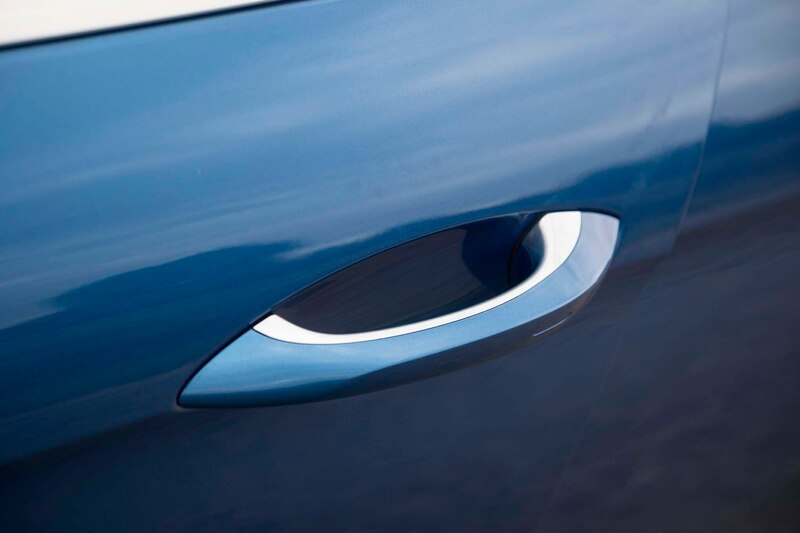 As I caught an eyeful of his car’s bulbous rump, I understood what the fuss was all about. 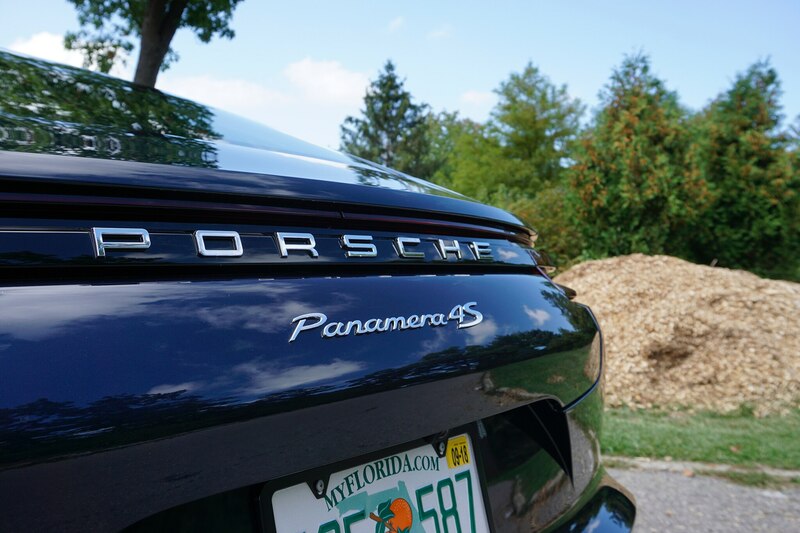 The 2017 Panamera 4S I was driving ruined his day. 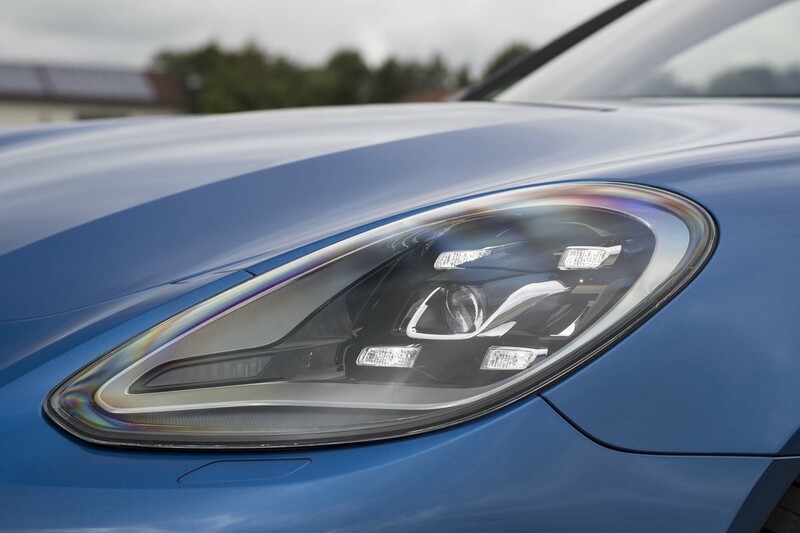 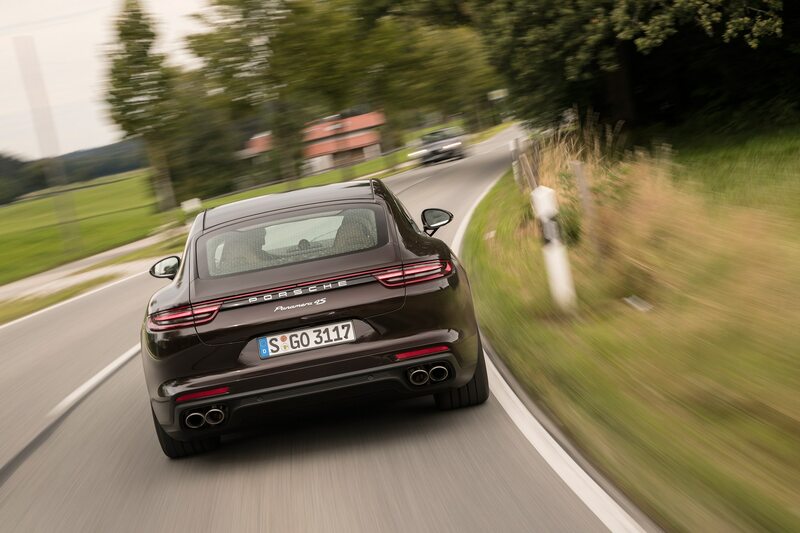 When people turn their heads at the barge-ish Panamera nowadays, it’s with wide eyes instead of a gag reflex. 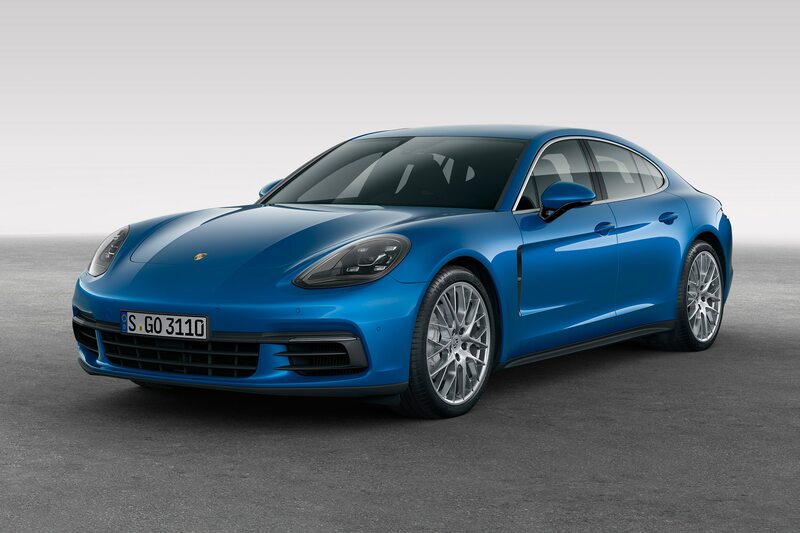 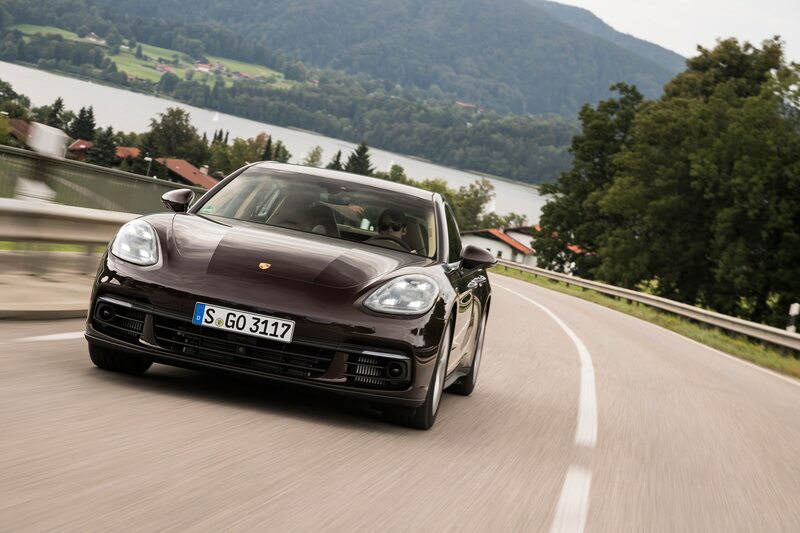 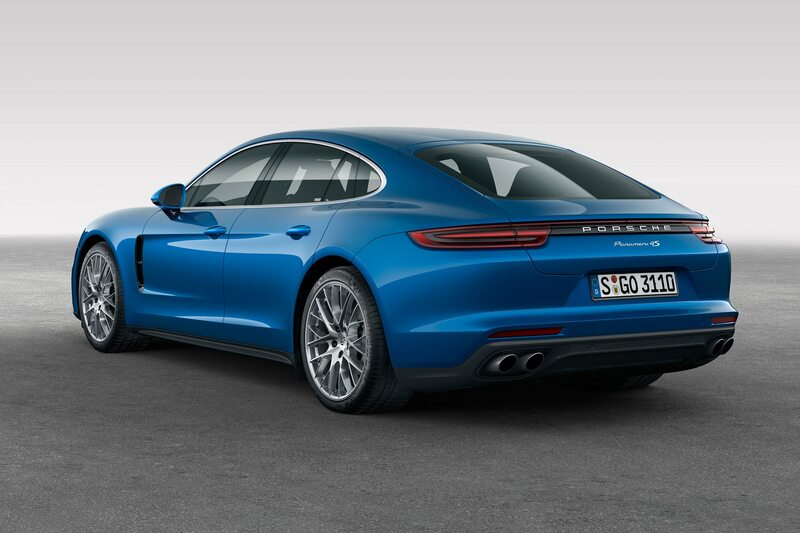 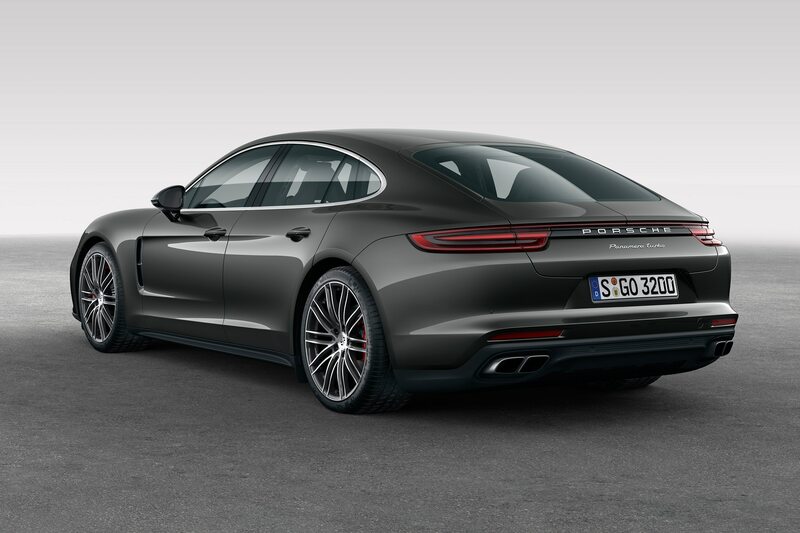 Yes, the Panamera is no longer the obese black sheep of the otherwise athletic Porsche family. Without making the car any smaller (the wheelbase is about 1.2 inches longer), Porsche made the new luxury sedan look much more cohesive. Although the roof profile and rear end have been completely overhauled, it’s still totally recognizable, owing to a very similar front end. 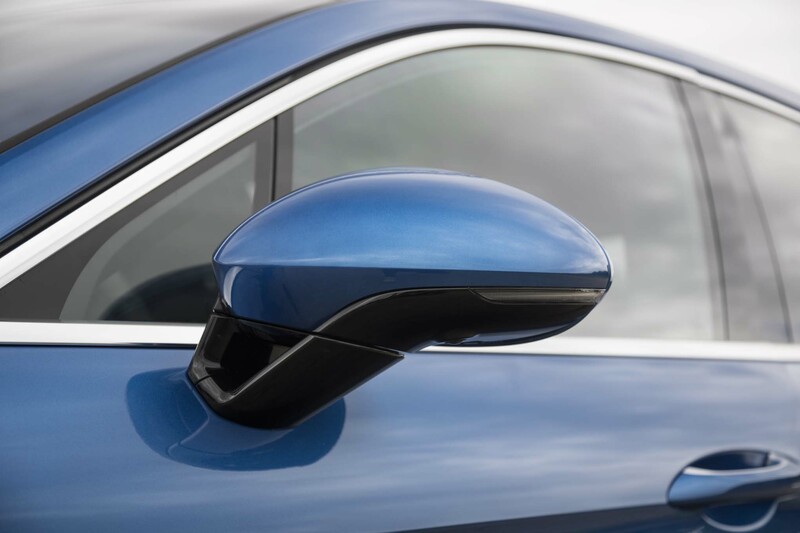 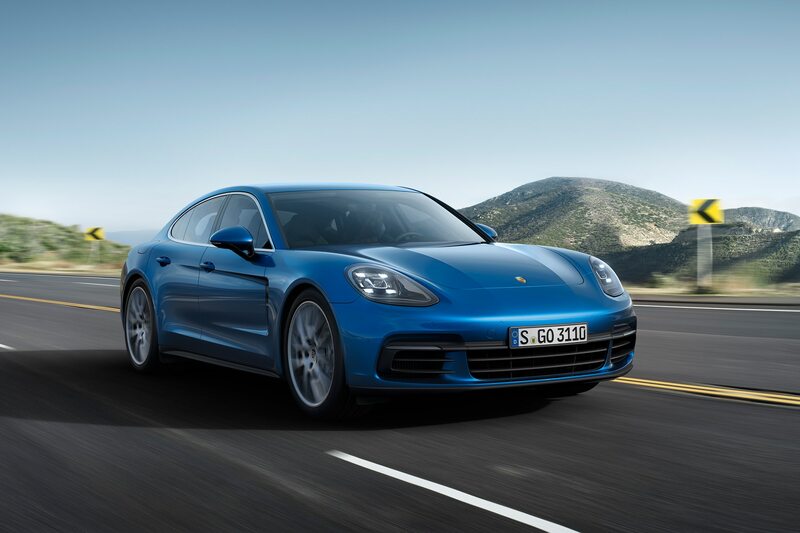 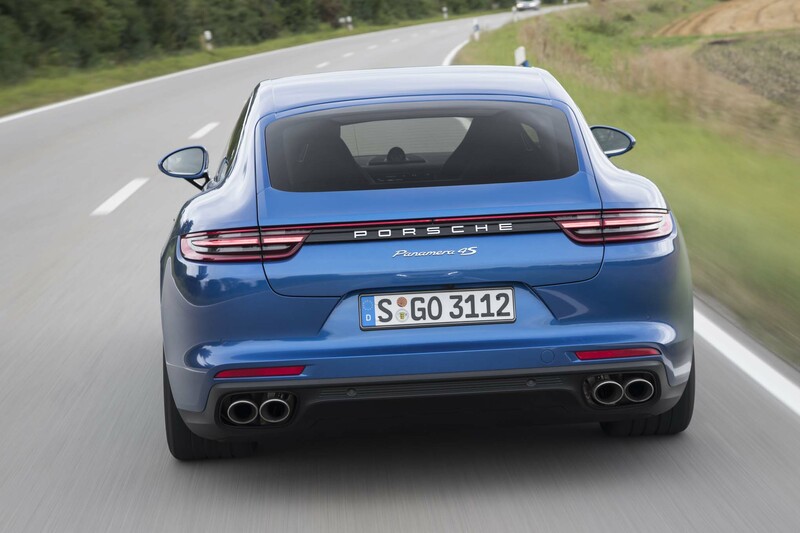 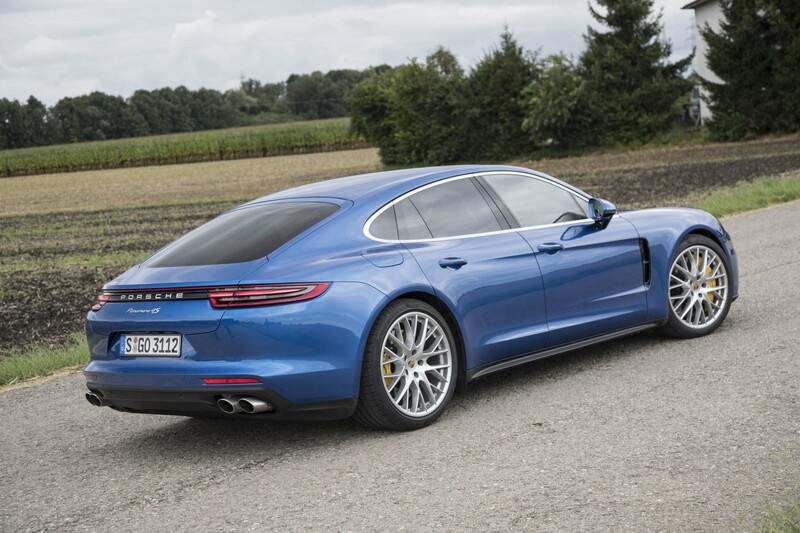 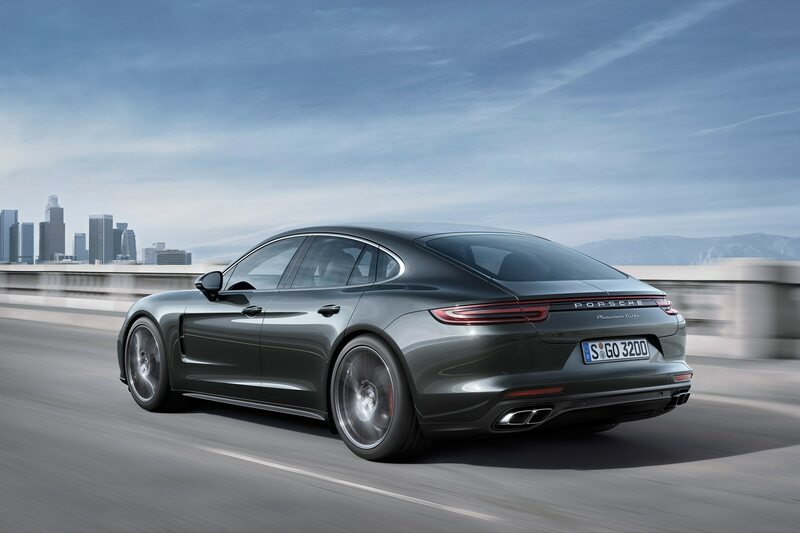 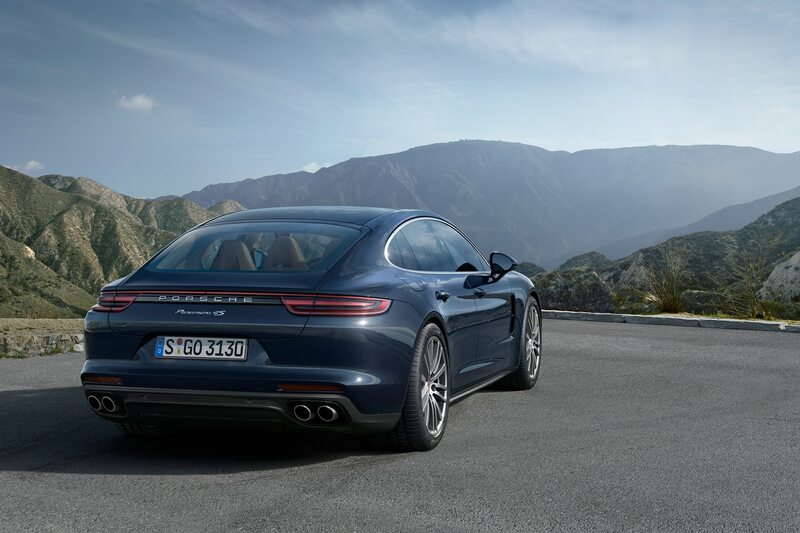 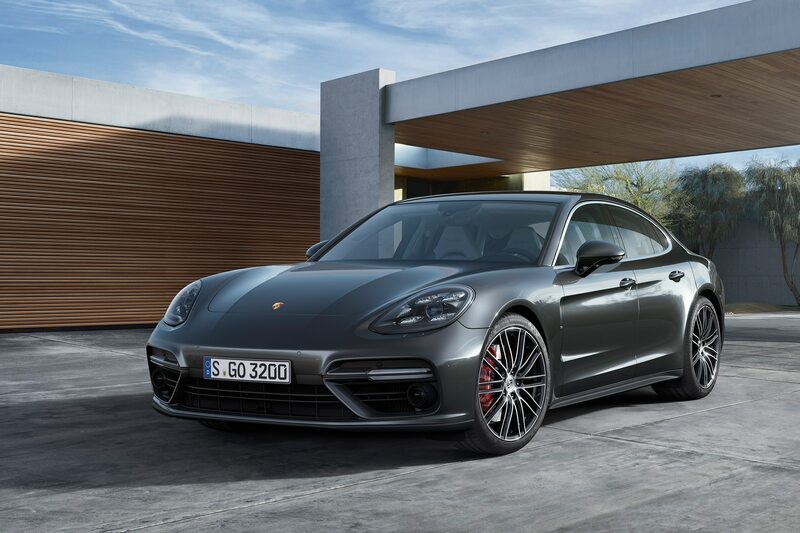 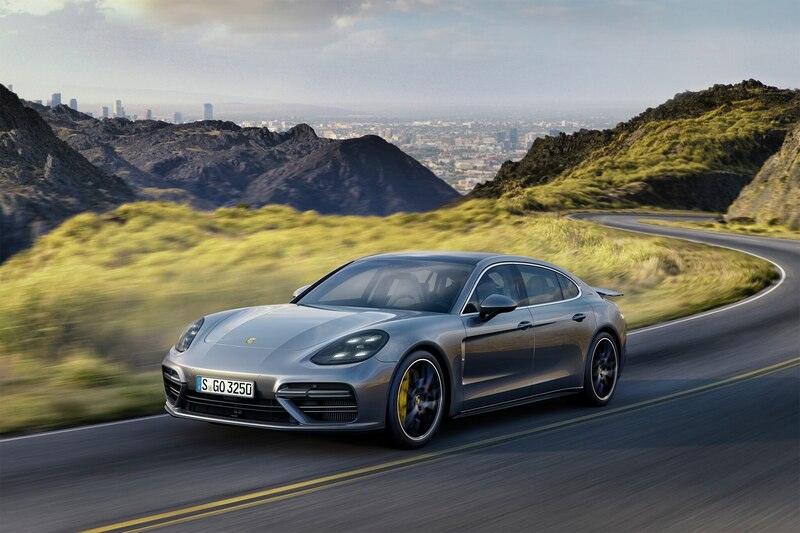 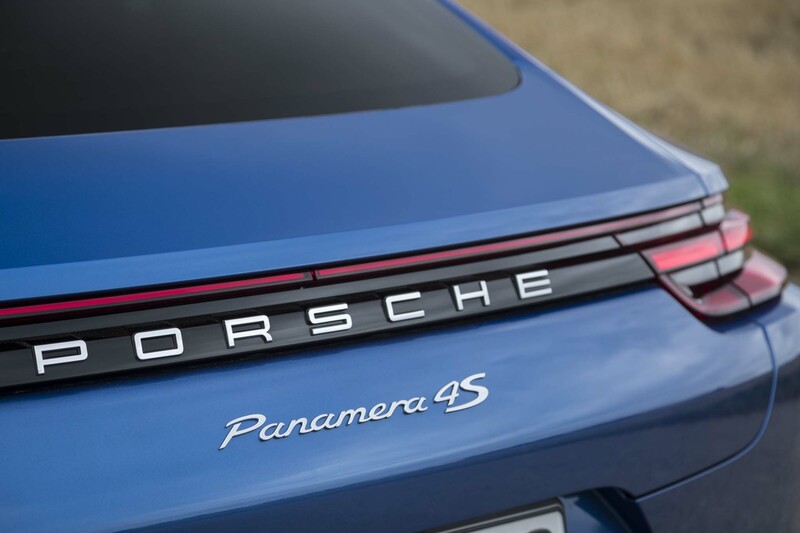 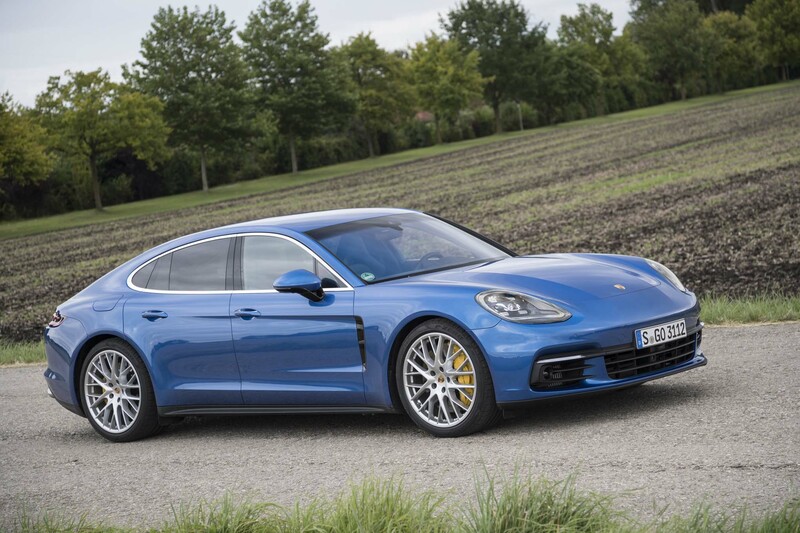 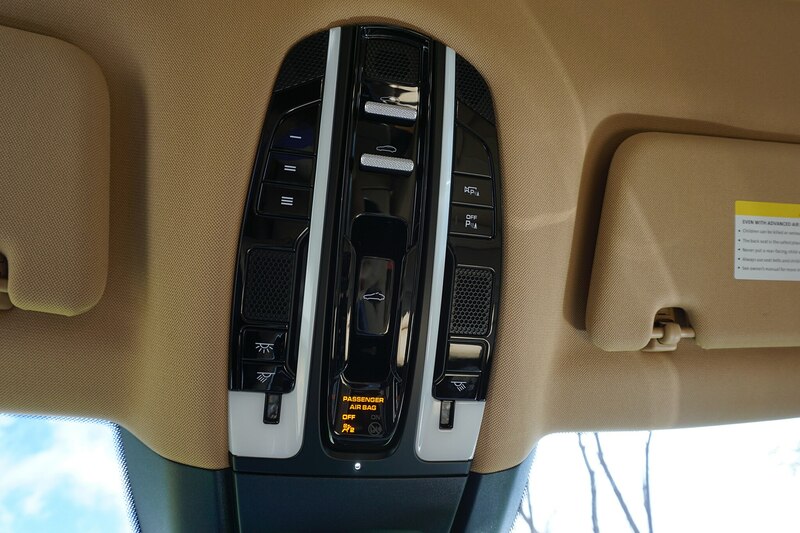 The roofline is noticeably sharper, and some may even see a little 911 in the Panamera’s cab-backward proportions. 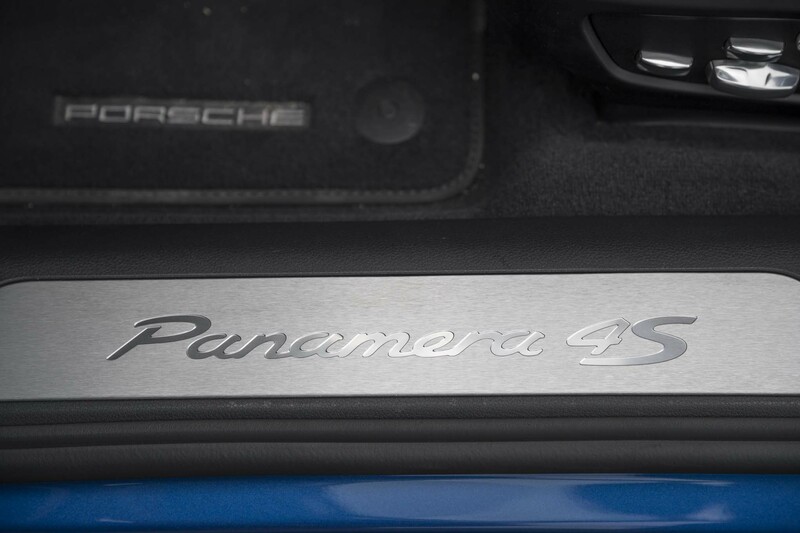 Also borrowed from the 911 is a horizontal LED light bar for the more sharply defined rear bumper, complete with fresh Porsche badging we’ve seen on the new 718 Cayman and Boxster. 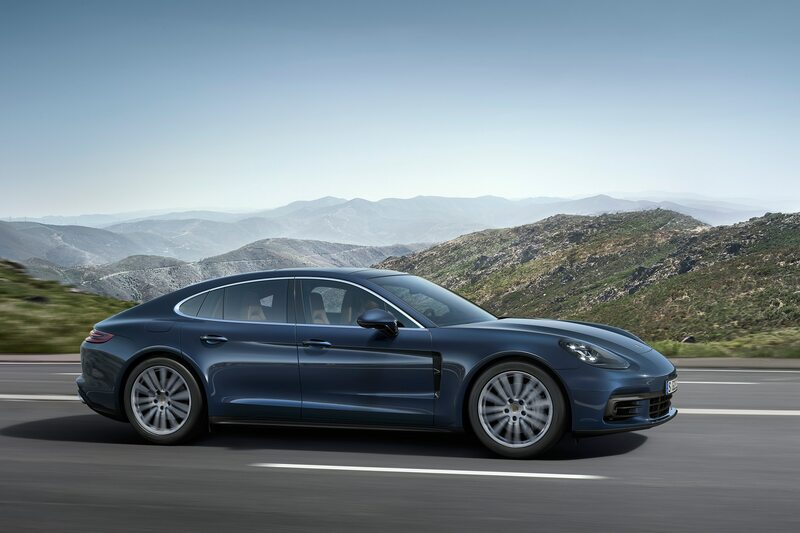 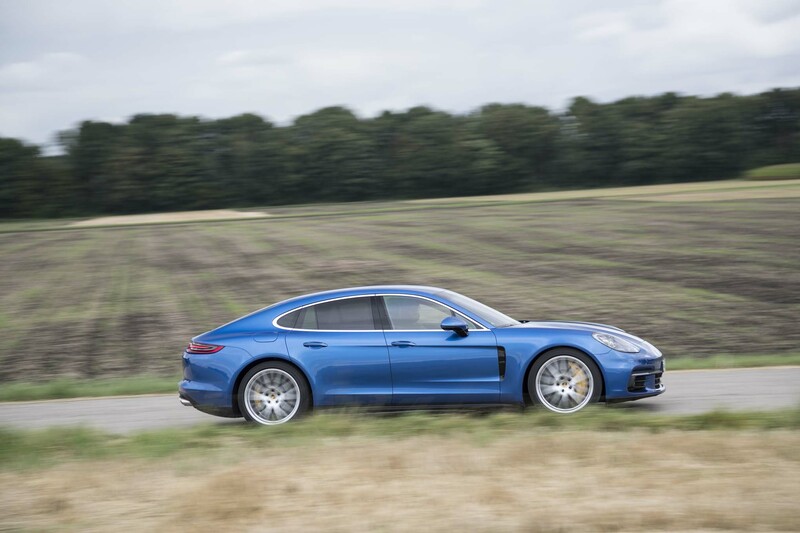 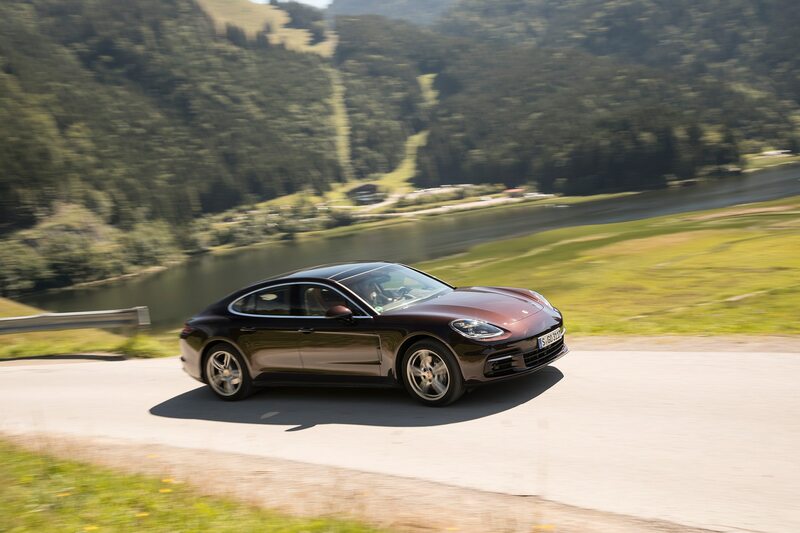 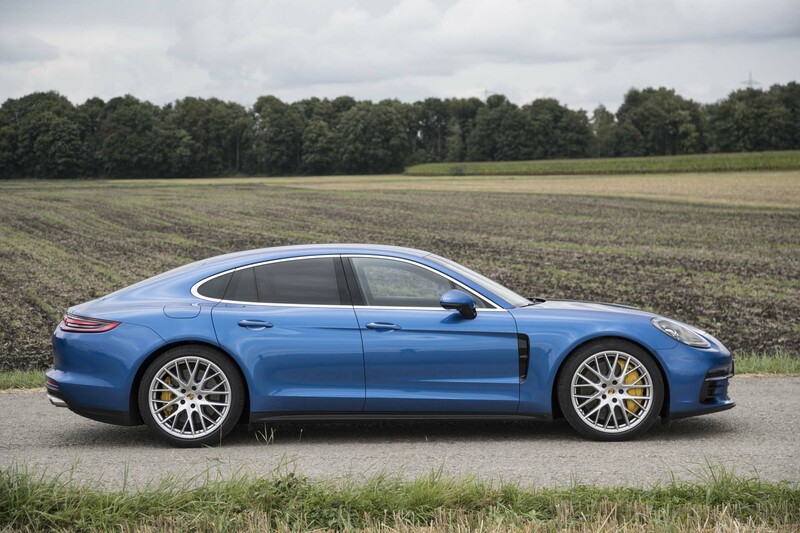 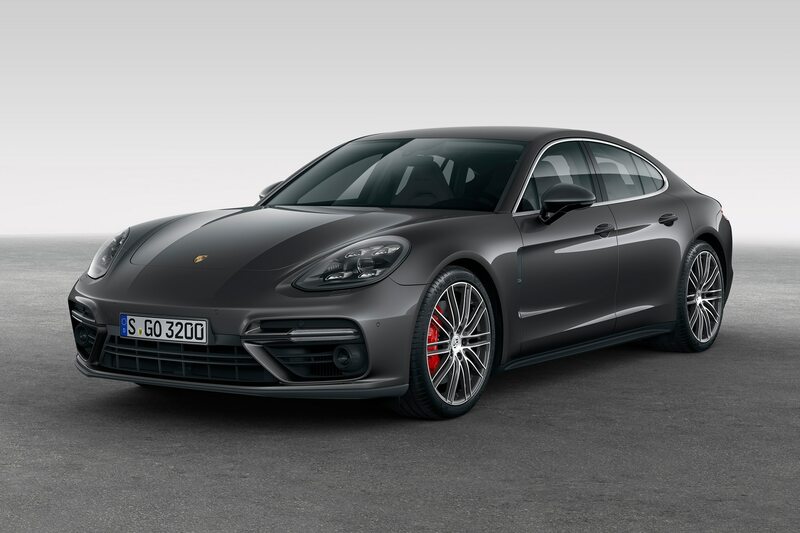 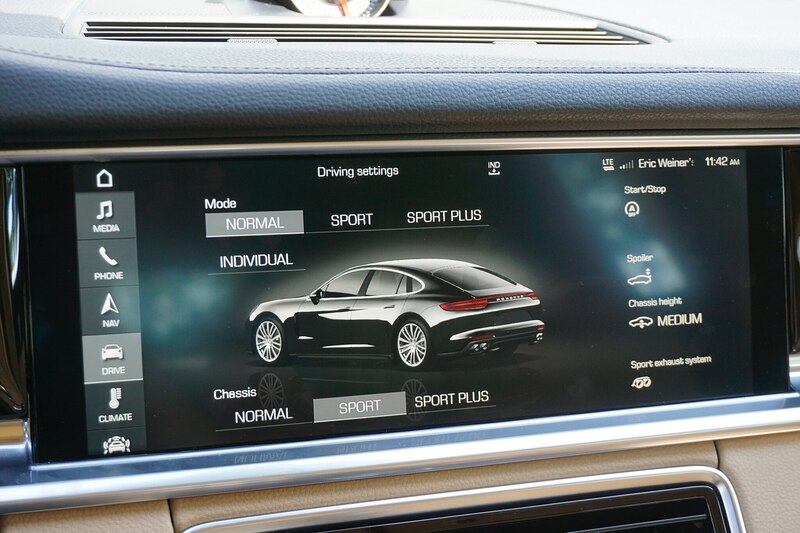 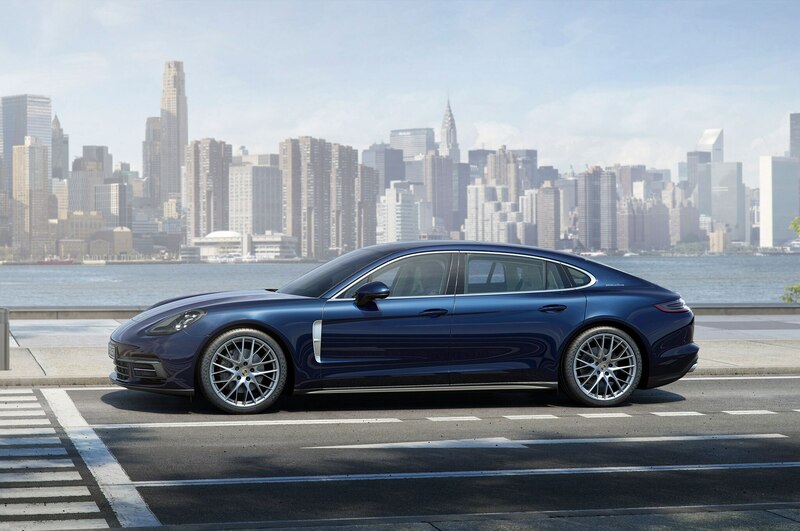 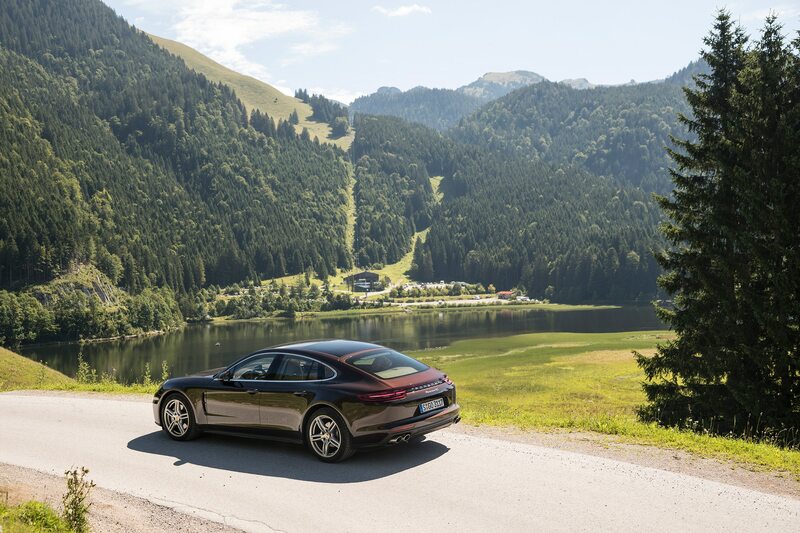 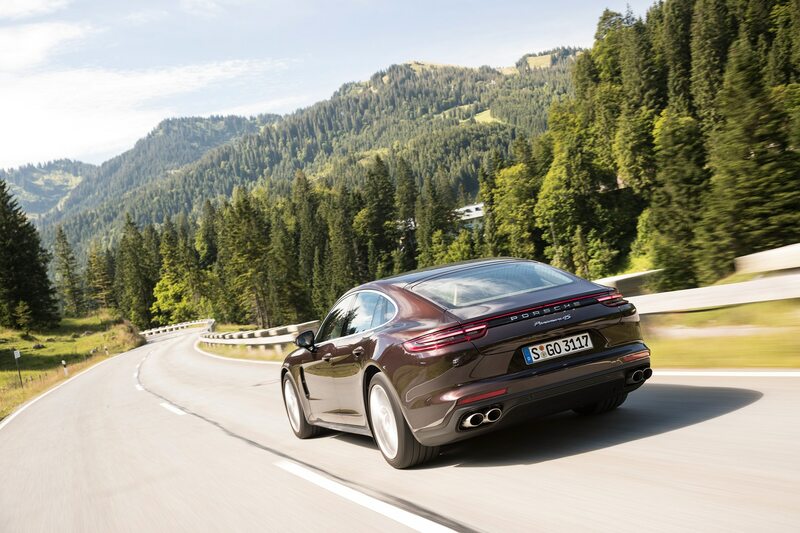 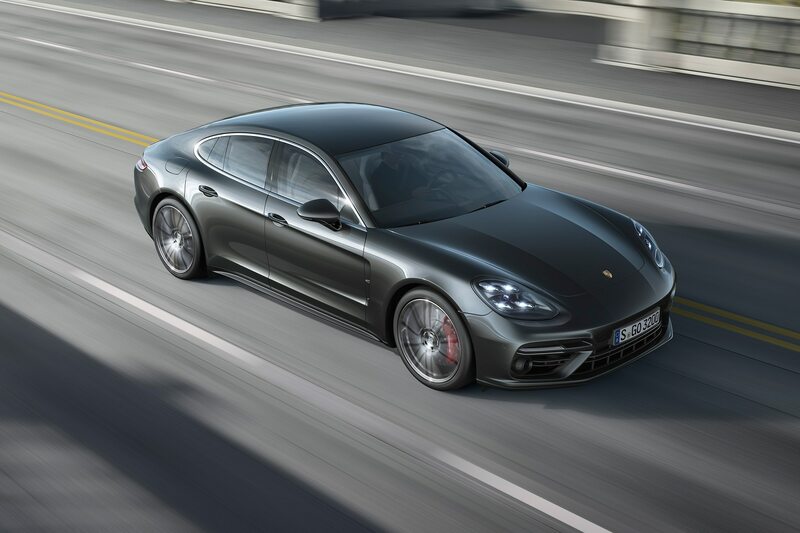 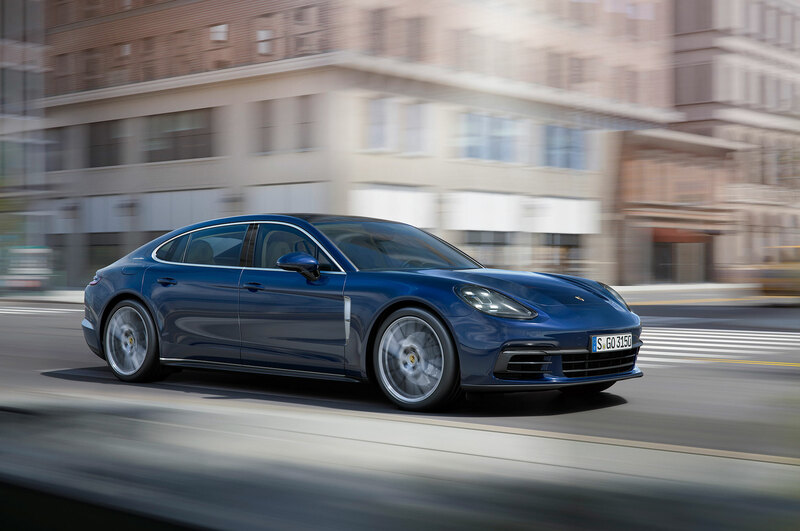 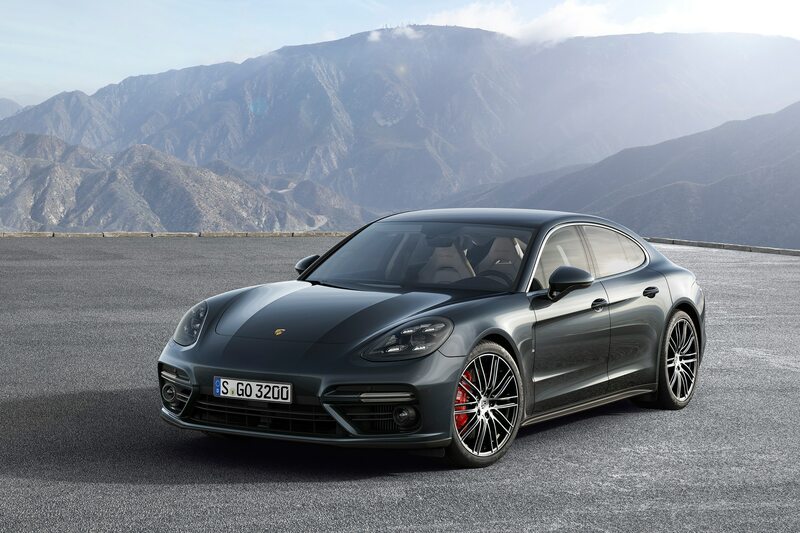 Given all that’s gone into the Panamera’s new silhouette, it’s a relief that the effect is still befitting of a classy full-size luxury sedan. 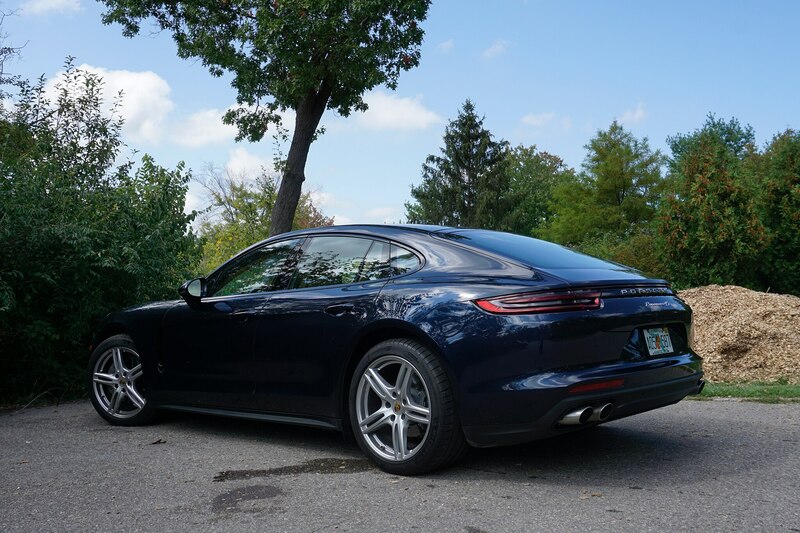 It’s refined and not overly exuberant, especially in my tester’s dark blue metallic paint and 20-inch five-spoke Turbo wheels. 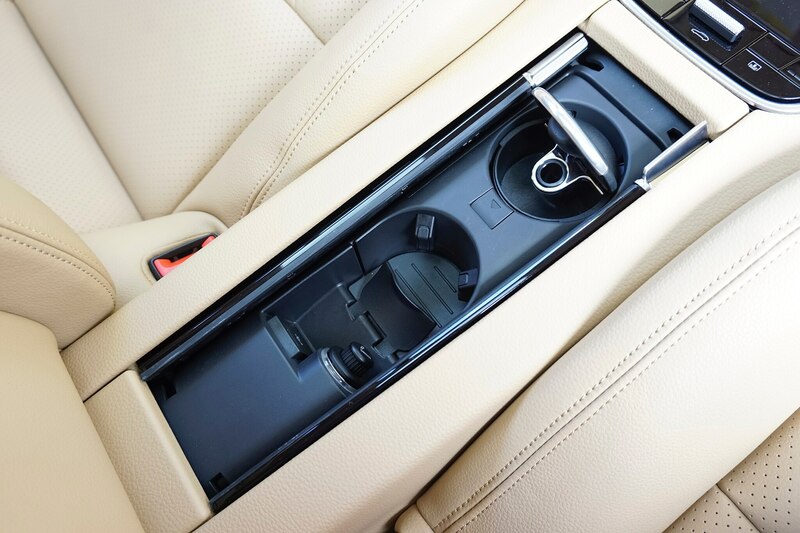 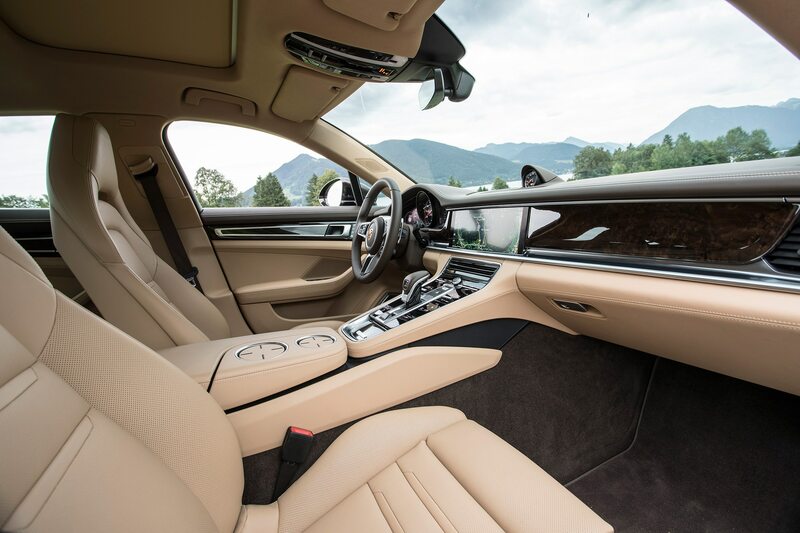 The interior has also benefited from a fresh perspective. 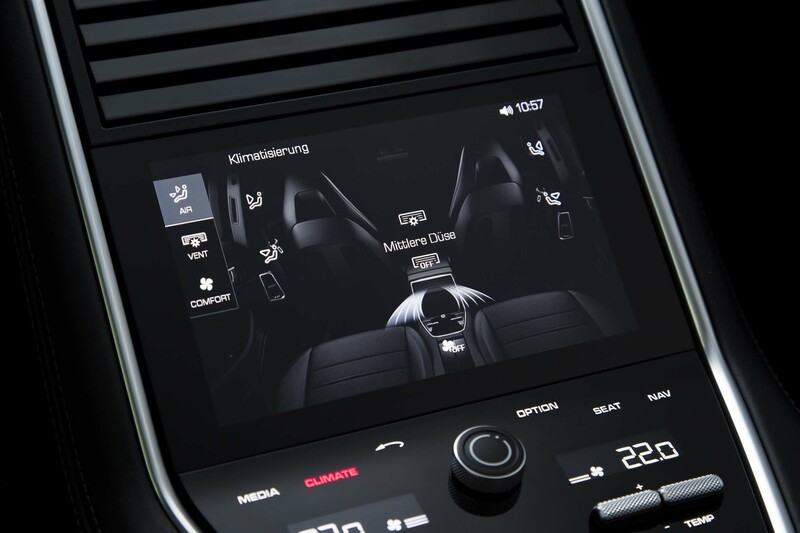 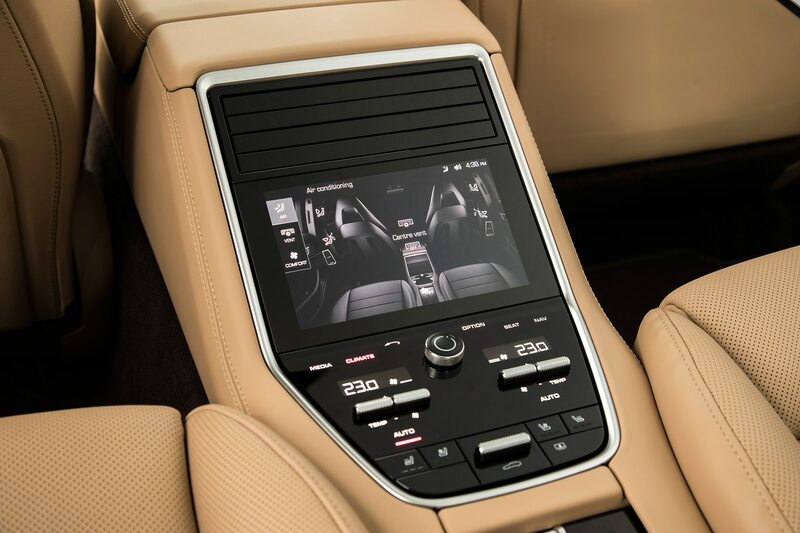 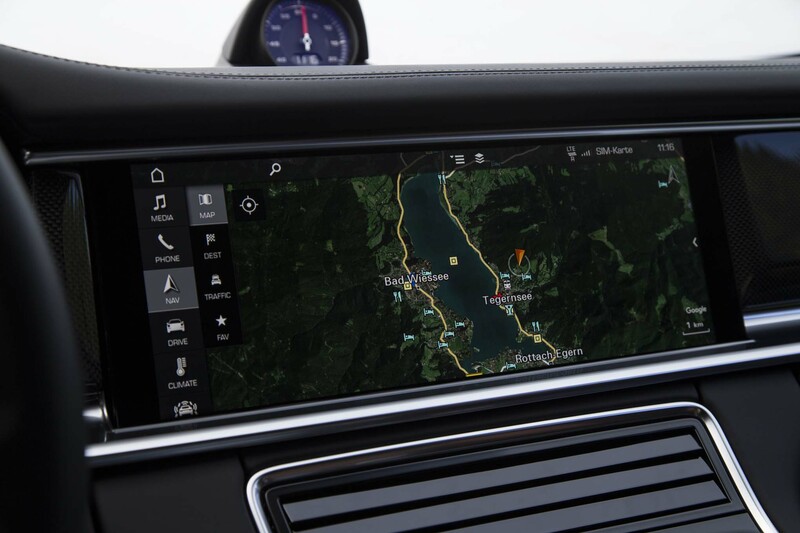 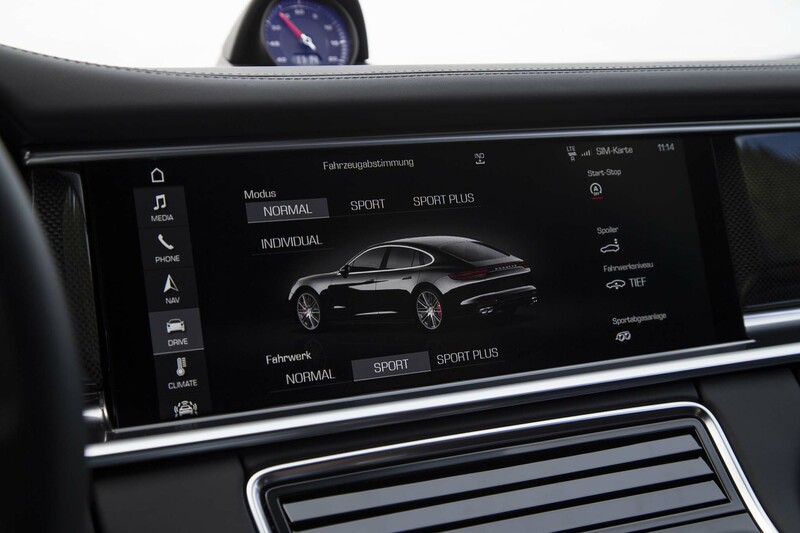 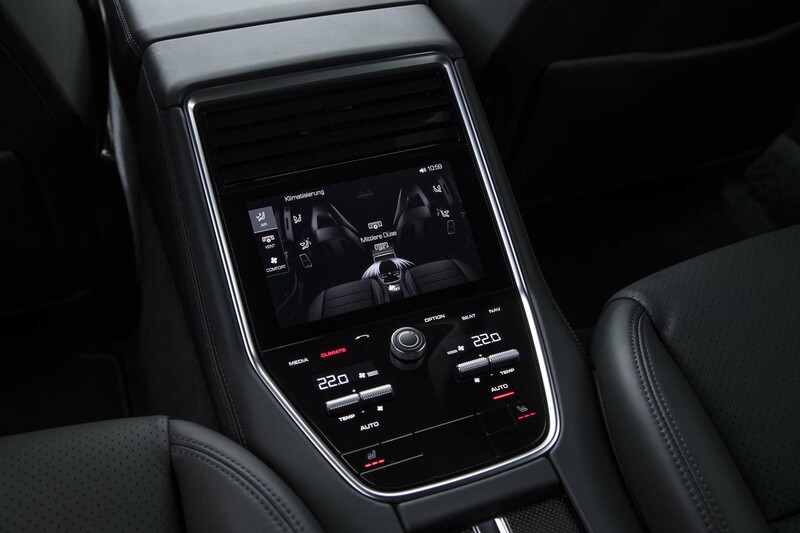 Dominating the center of the dashboard is a seriously sleek 12.3-inch touchscreen display, which flows subtly down into a haptic-reactive control panel between the front seats. 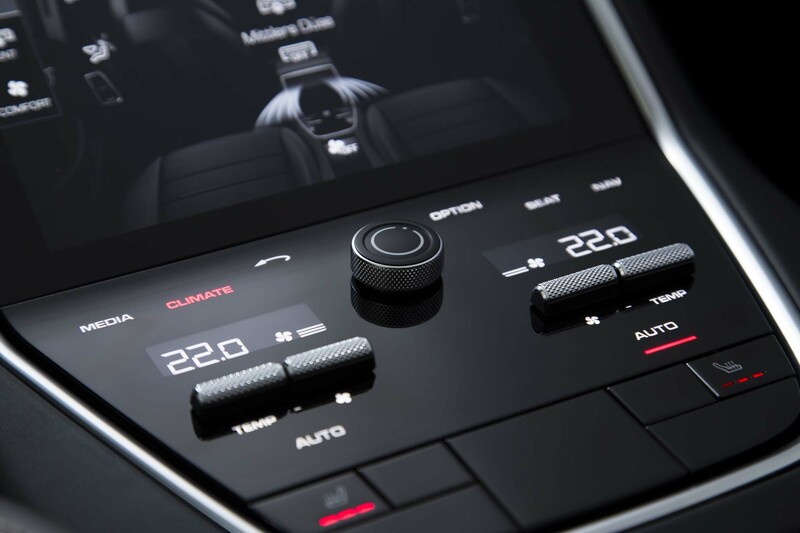 Not only is the screen crystal clear, it’s easy to control and intuitive to master. 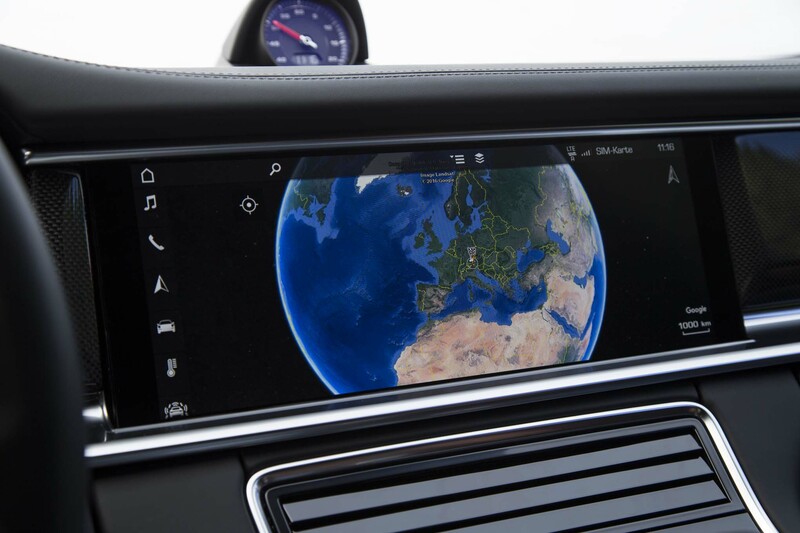 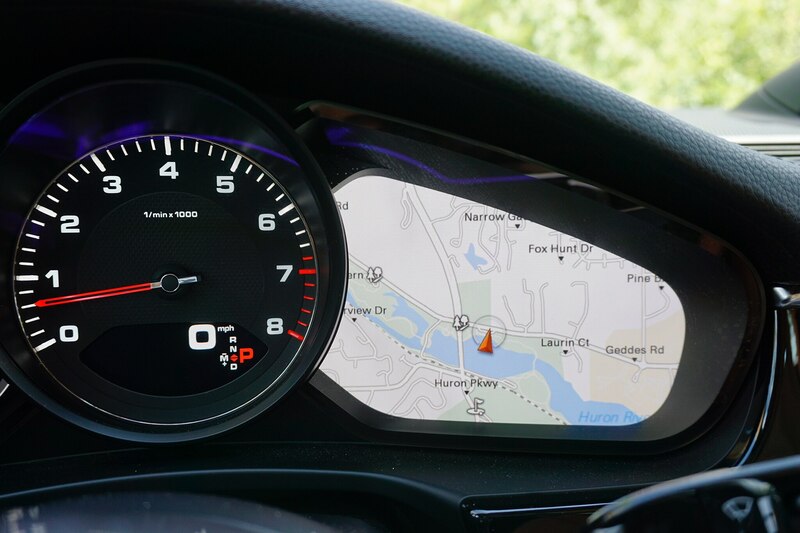 (Apple CarPlay can be had for those who prefer to simply mirror their phones.) 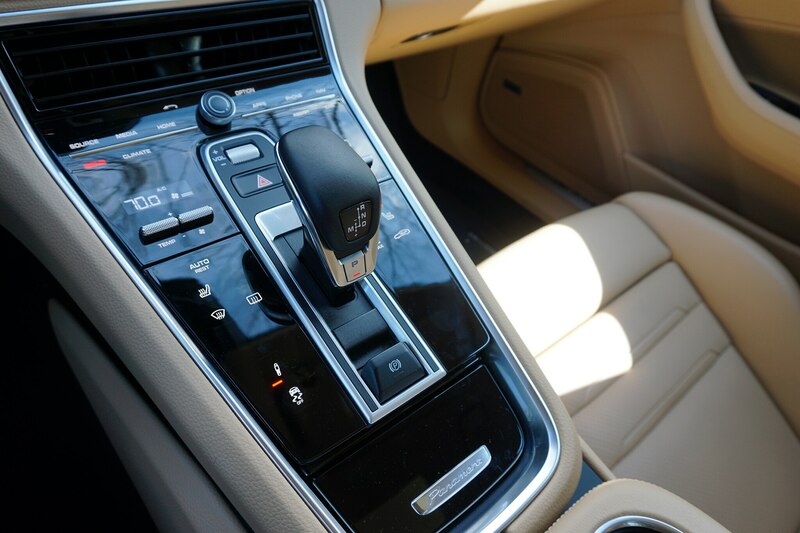 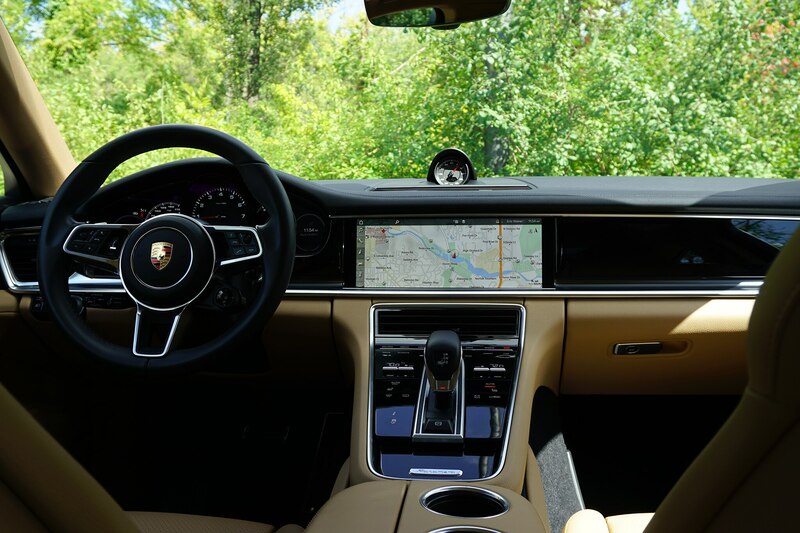 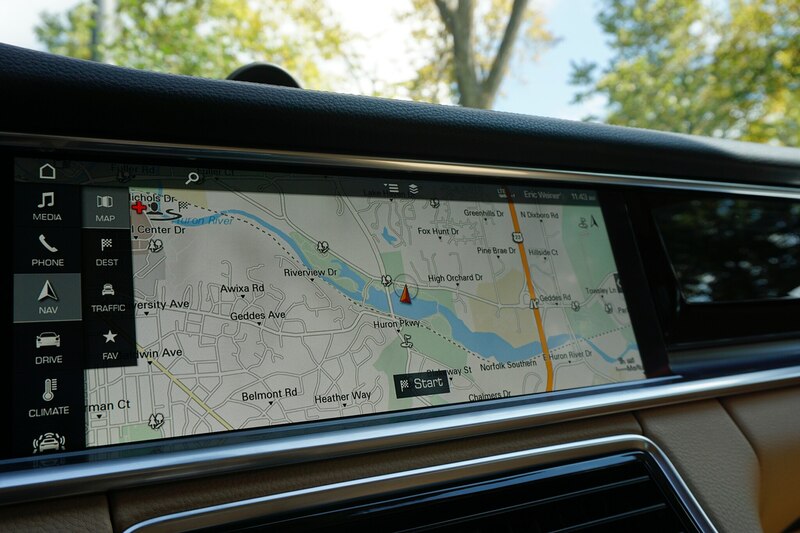 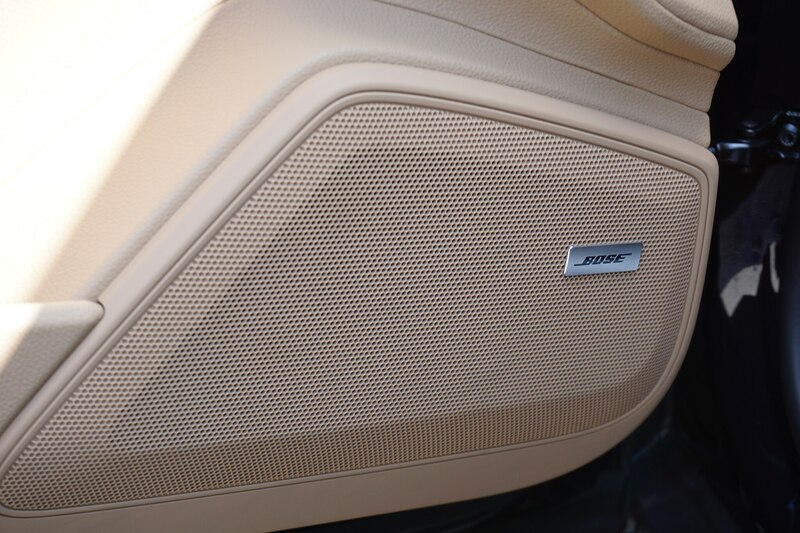 Shy of collecting oily thumbprints, there’s little to nitpick about with the haptic center console, which is as precise and responsive as it is a massive improvement compared to the last Panamera’s jumbled button fest. 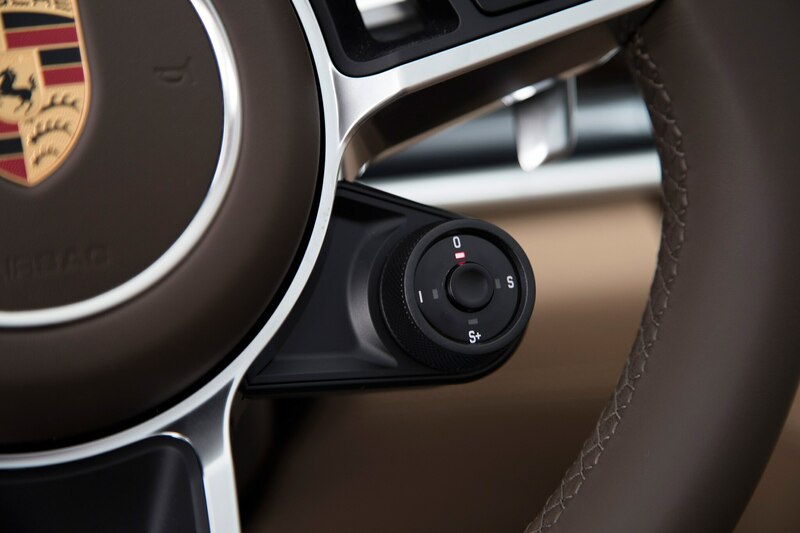 As always, Porsche nails the details, down to the distinctive key-shaped ignition switch and perfectly shaped steering wheel. 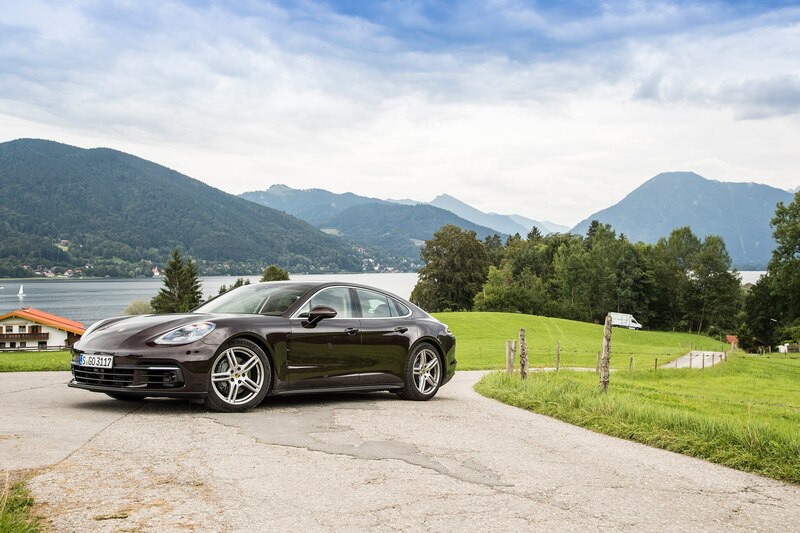 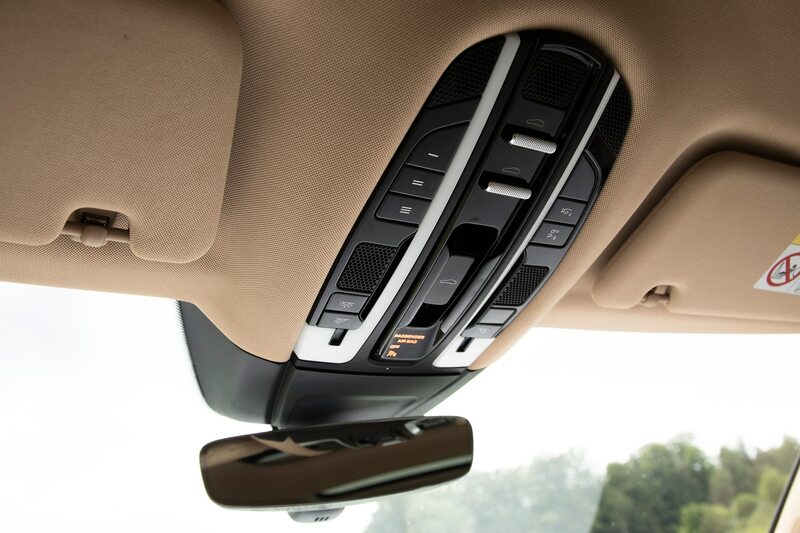 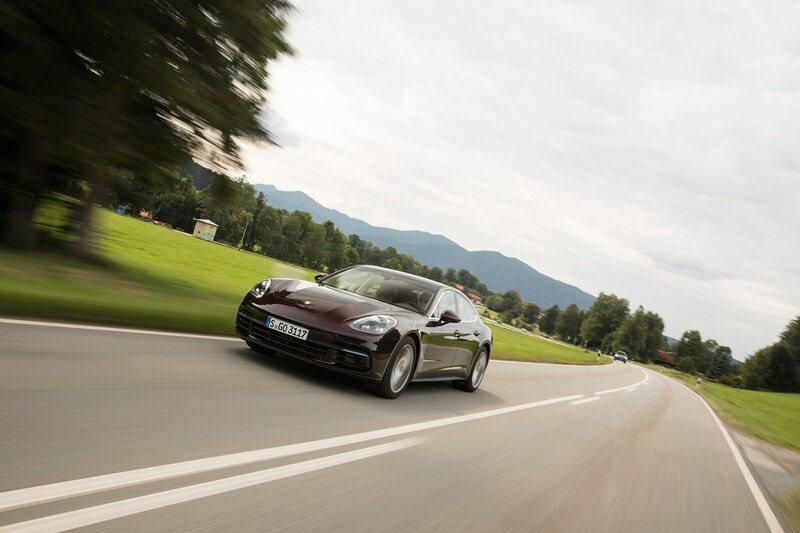 Even in its behemoth sedan, Porsche makes sure a driver feels right at home. 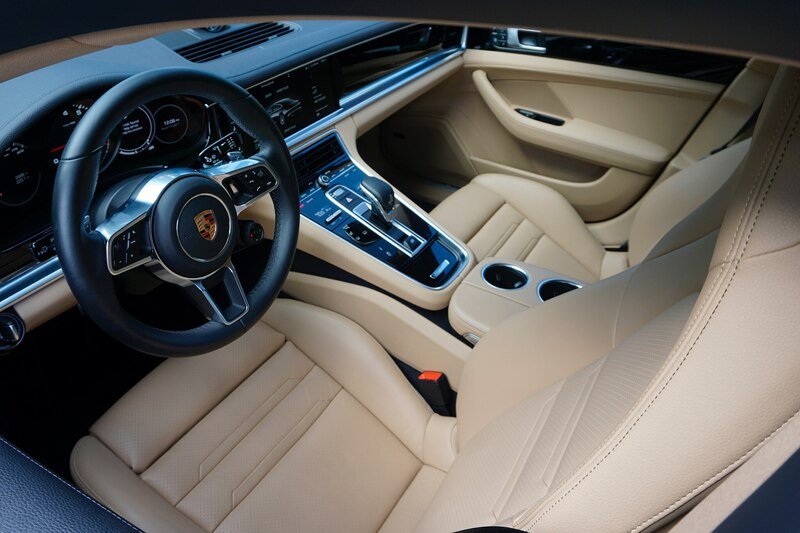 Porsche’s rear seats are more comfortable than anything I’ve got at home, too. 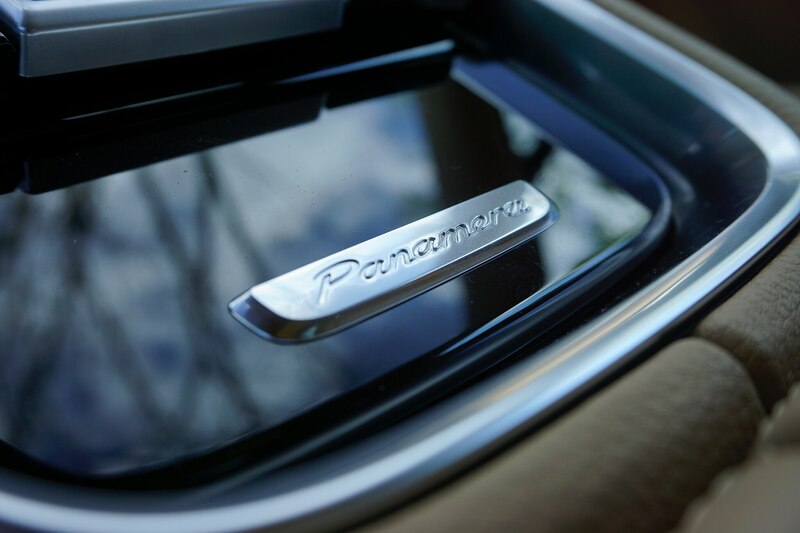 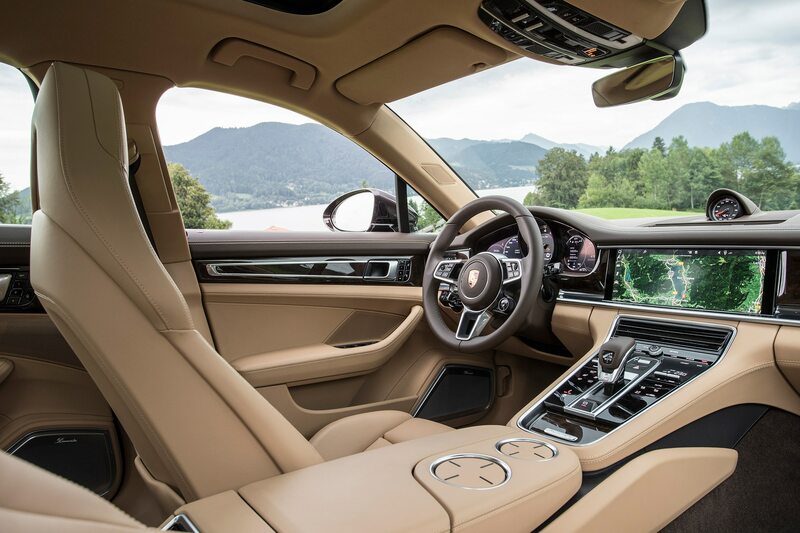 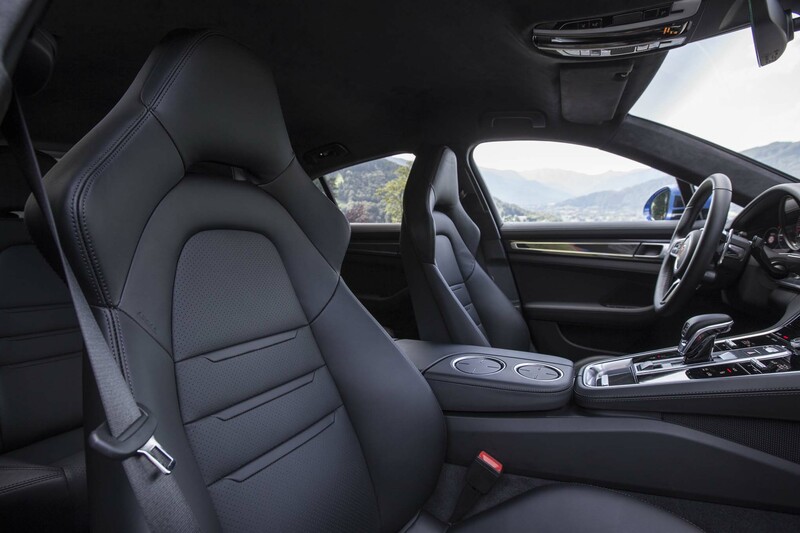 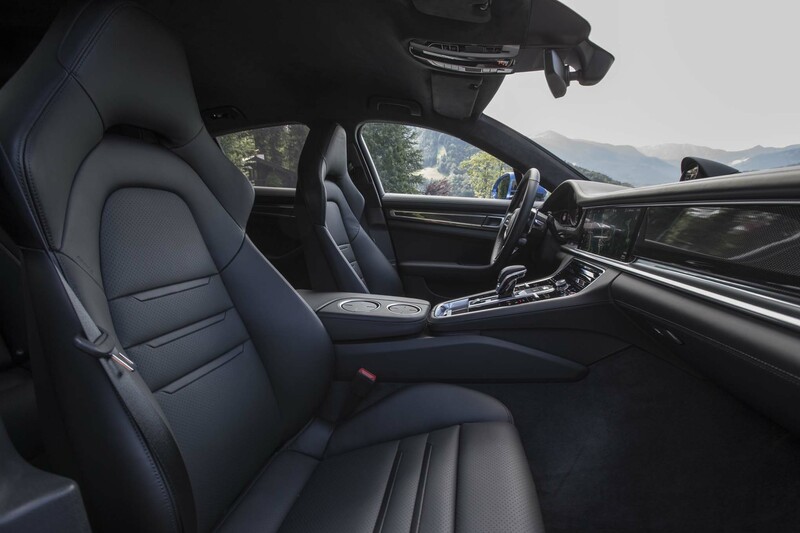 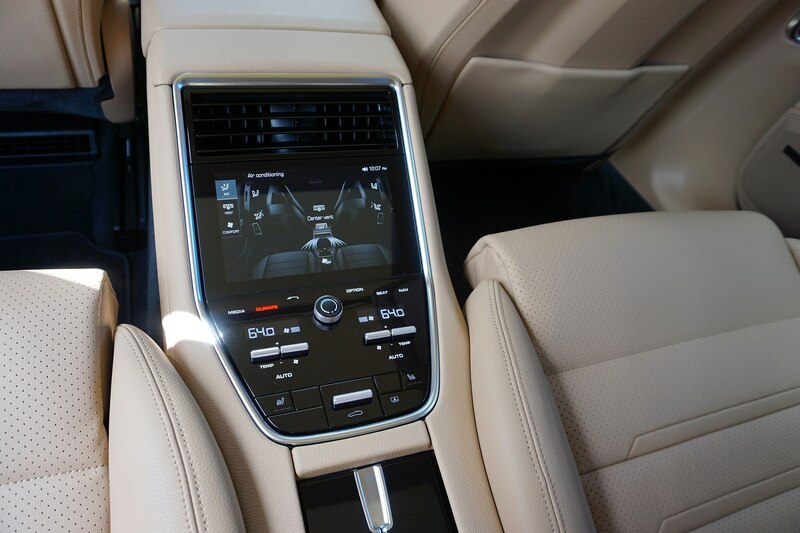 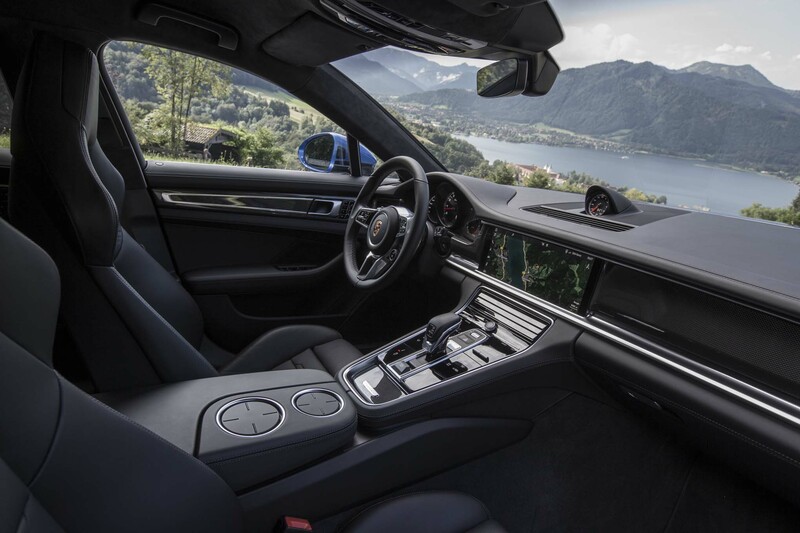 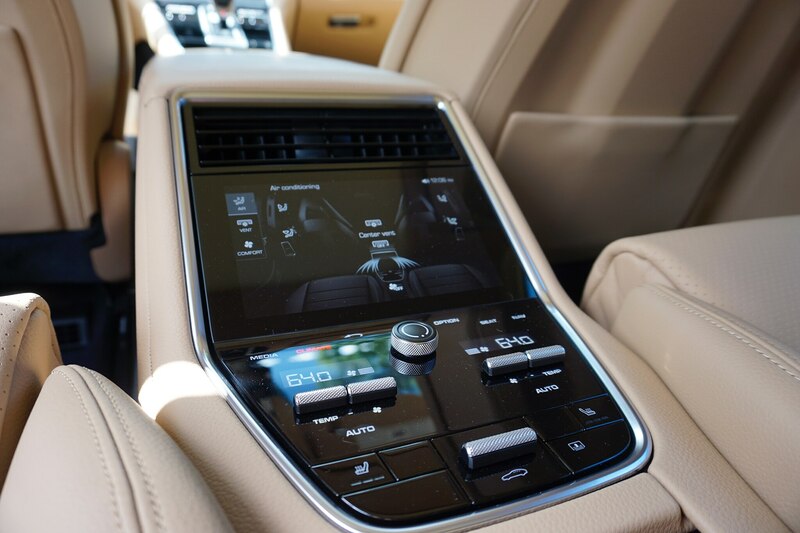 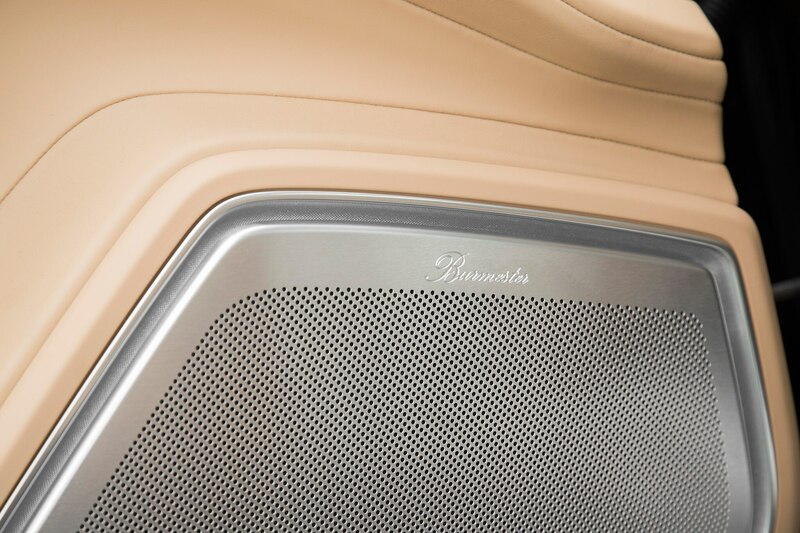 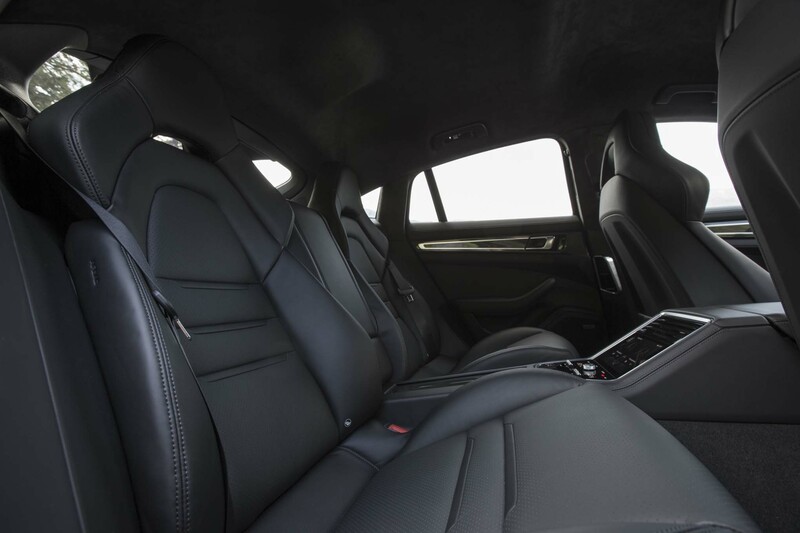 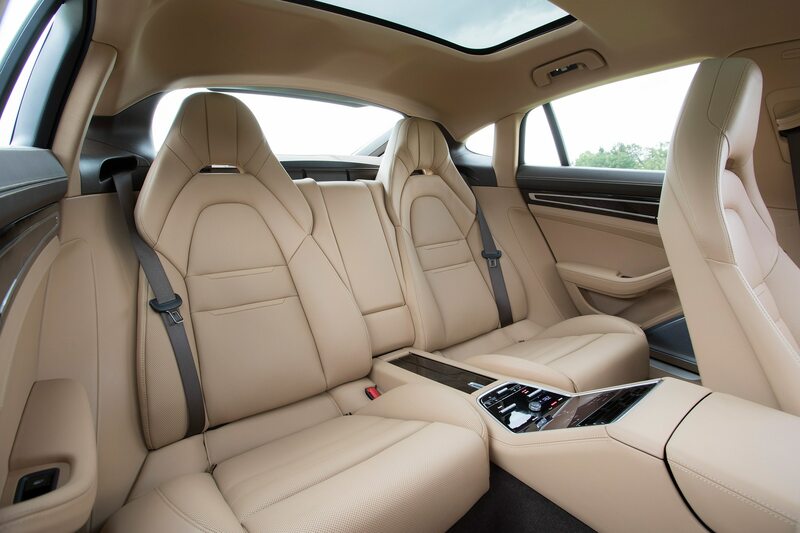 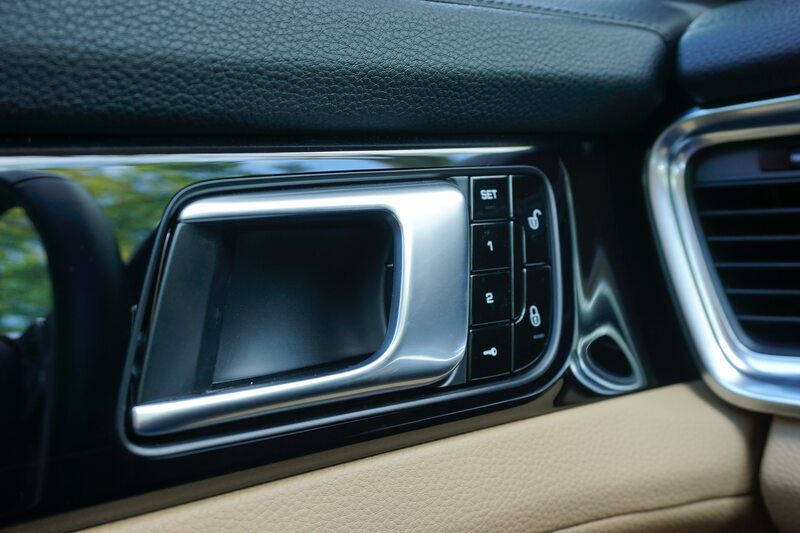 As is essential in a big luxury road yacht, the Panamera’s rear passengers are treated to a relaxing, slightly reclined seating position and gorgeous leather. 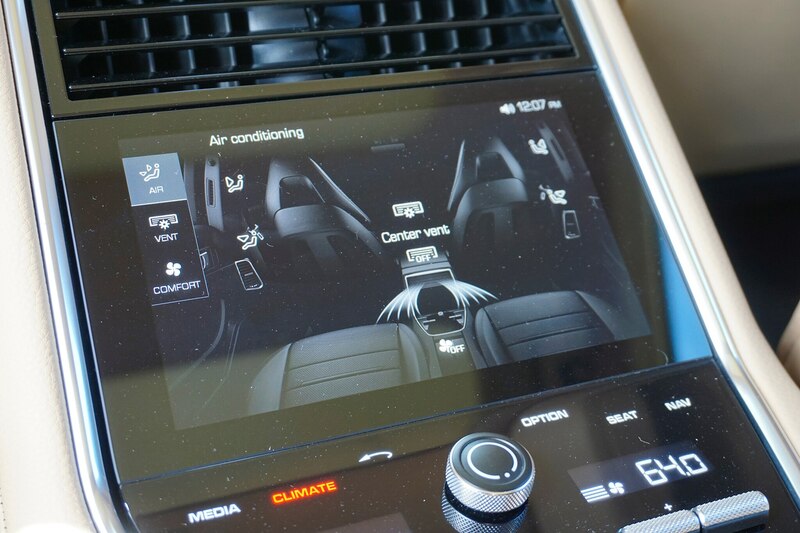 A similar haptic console setup with a dedicated monitor make controls from the rear a cinch, although the electronic center air-vent controls both up front and in back are overly complicated. 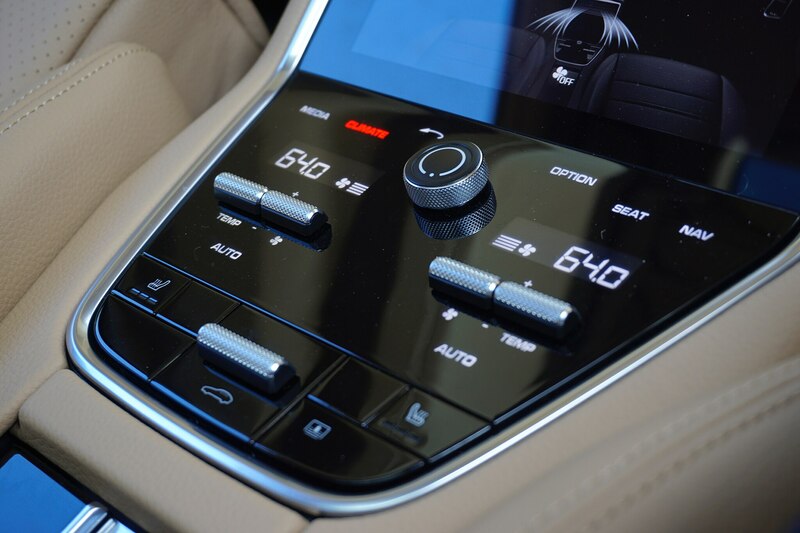 Simple analog would have done fine here without taking away from the ultra-modern feel. 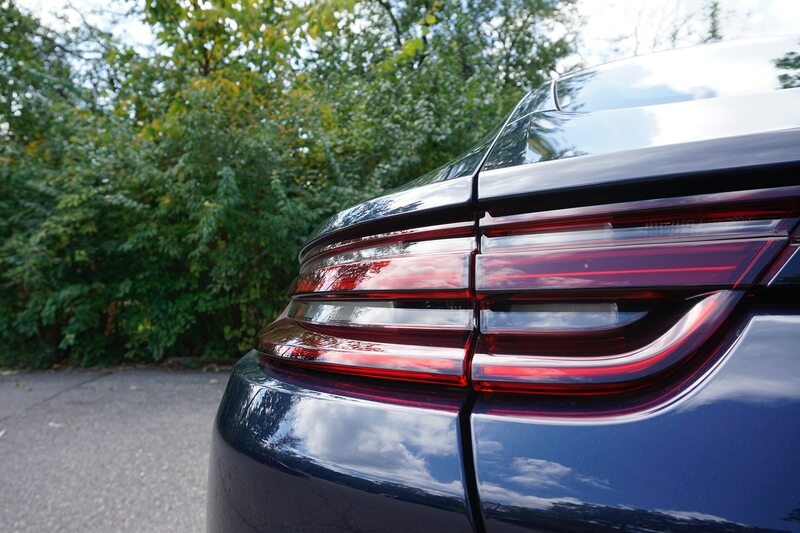 On to the red meat. 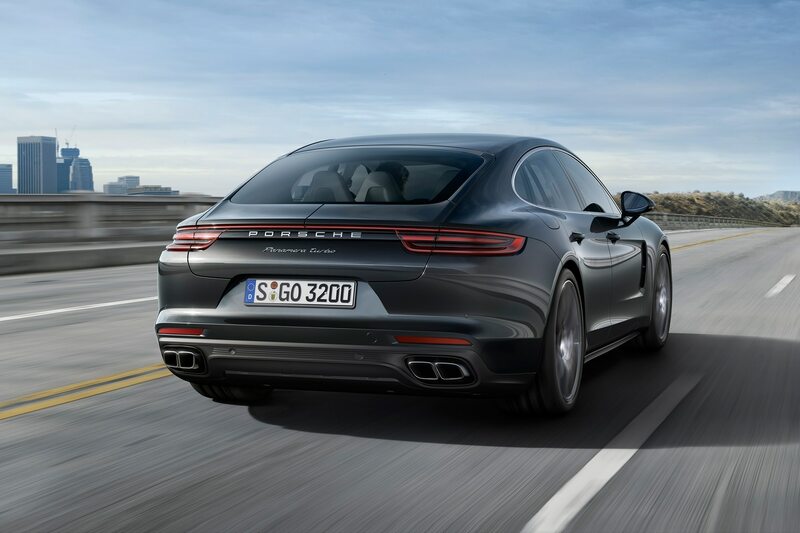 Under the hood is Porsche’s new 2.9-liter twin-turbo V-6, which is both more powerful, more torque rich, and more efficient than the 3.0-liter engine it replaces. 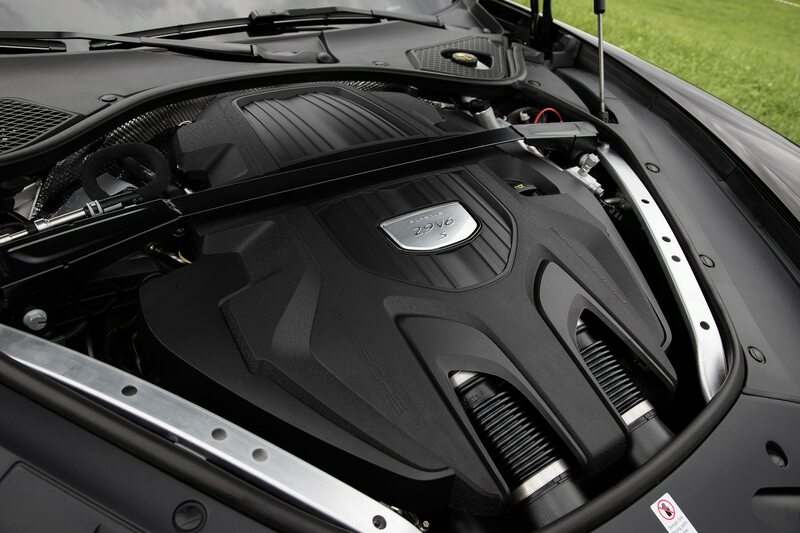 Now making 440 hp and 406 lb-ft of torque (increases of 20 hp and 22 lb-ft, respectively), the engine is refreshingly responsive and smooth, even under heavy loads and at high rpm. 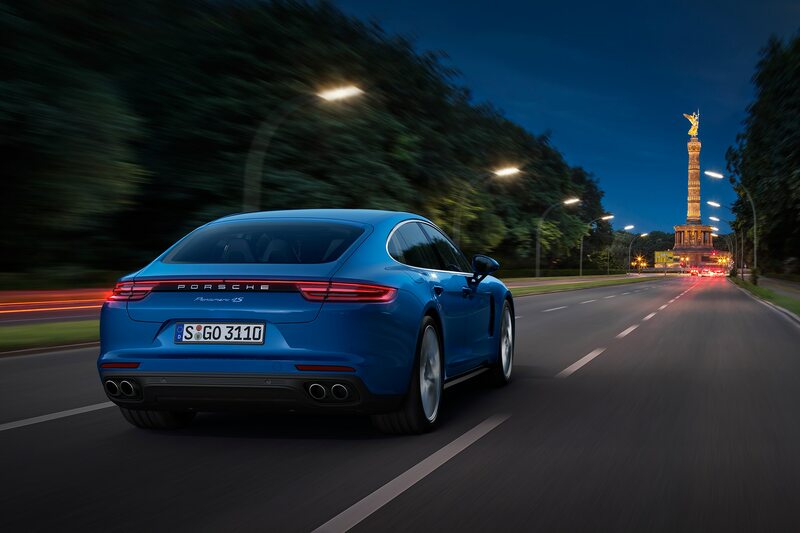 It seems to just pull and pull all the way to redline, where the engine makes a confident snarl. 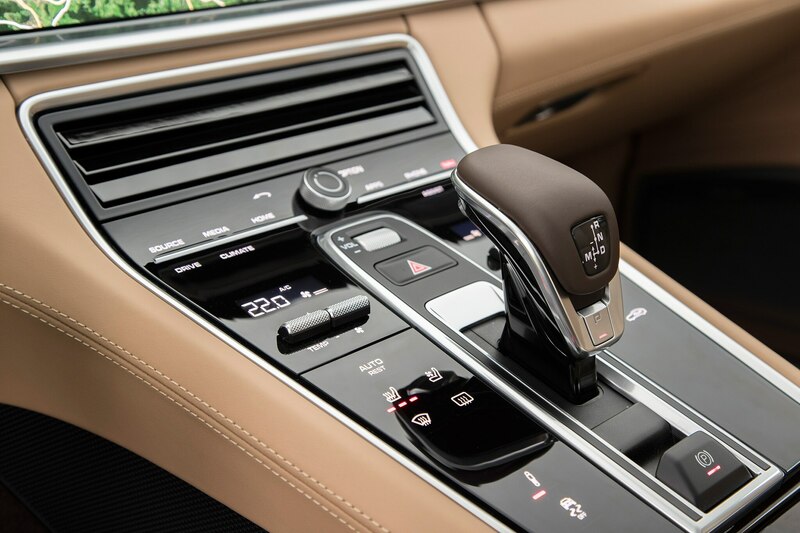 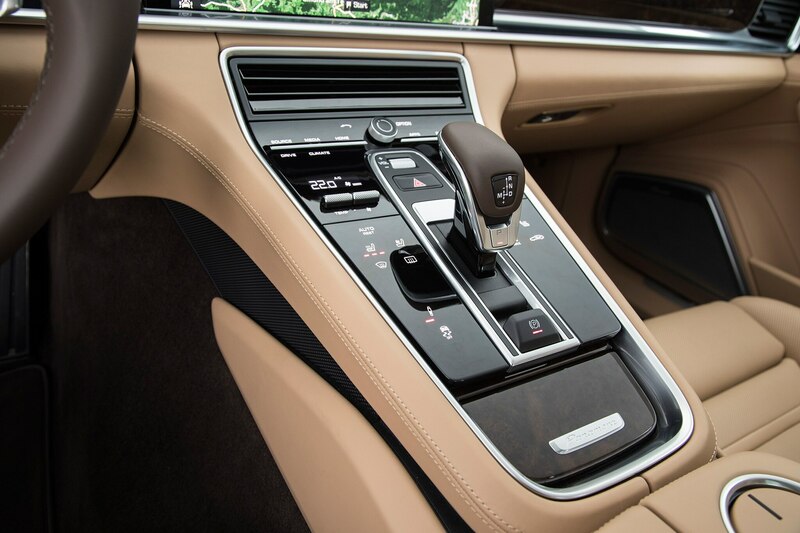 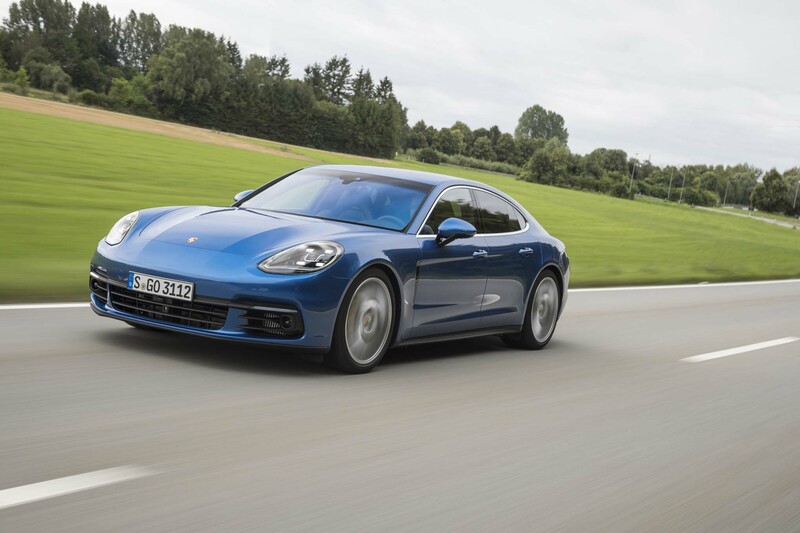 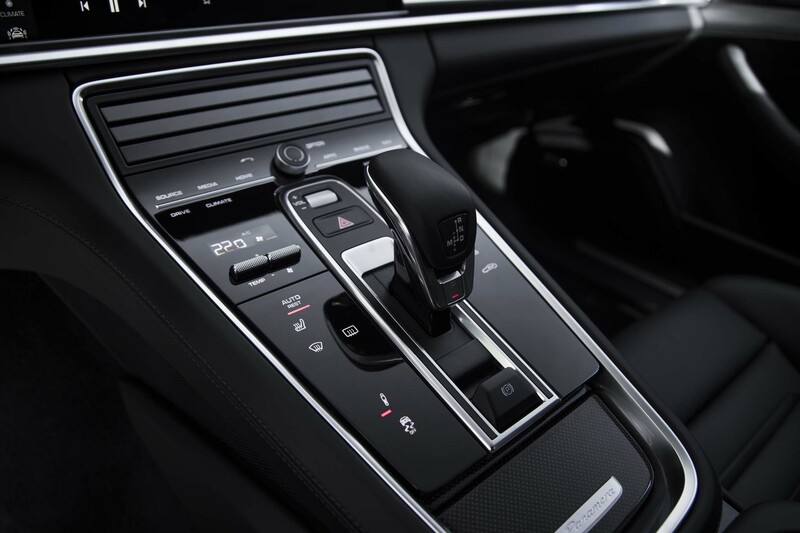 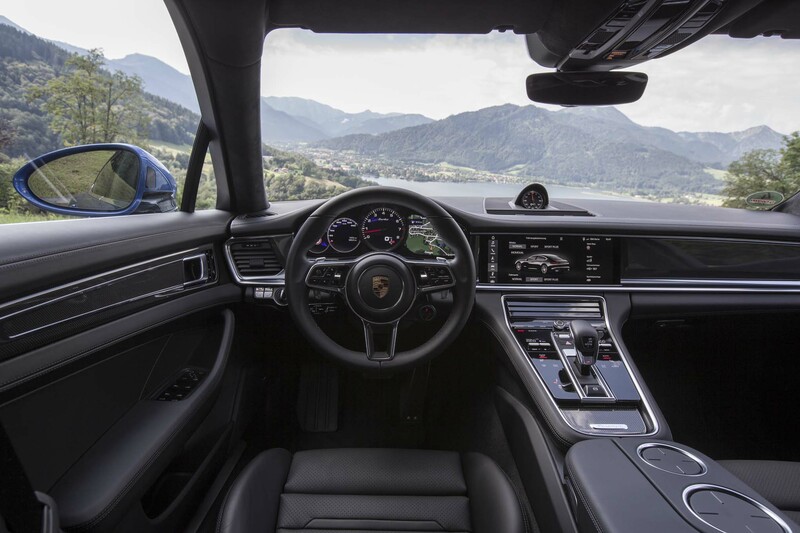 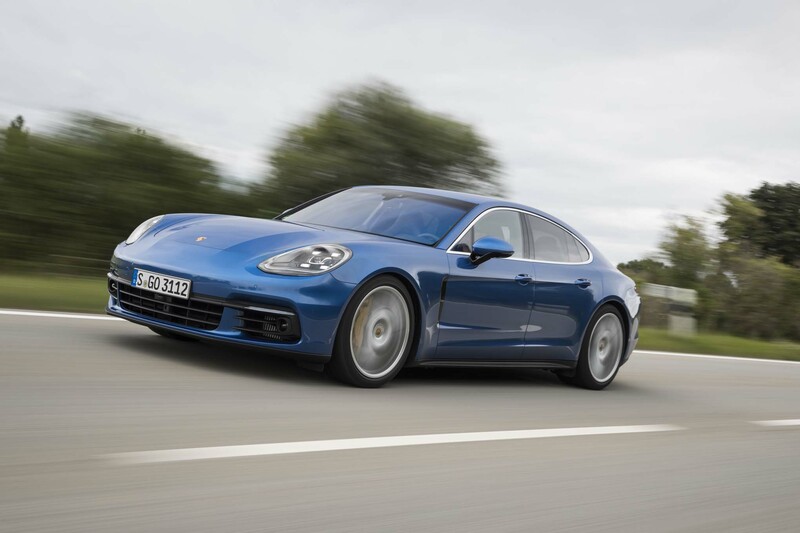 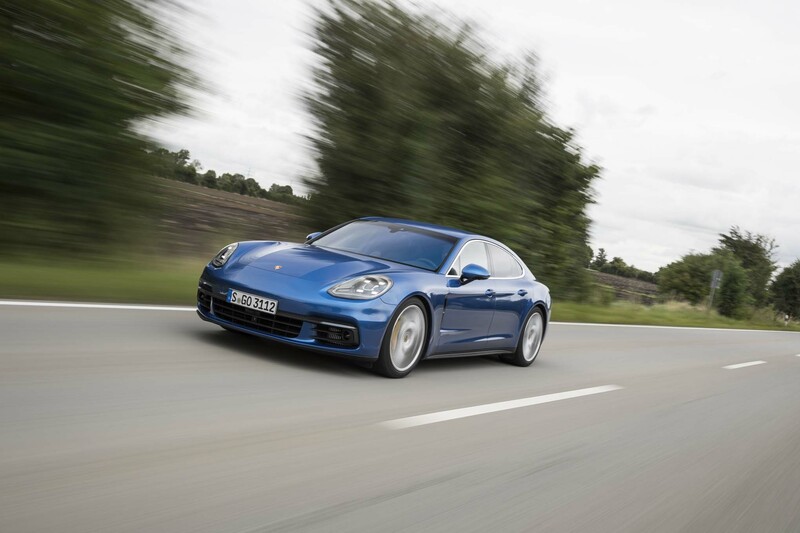 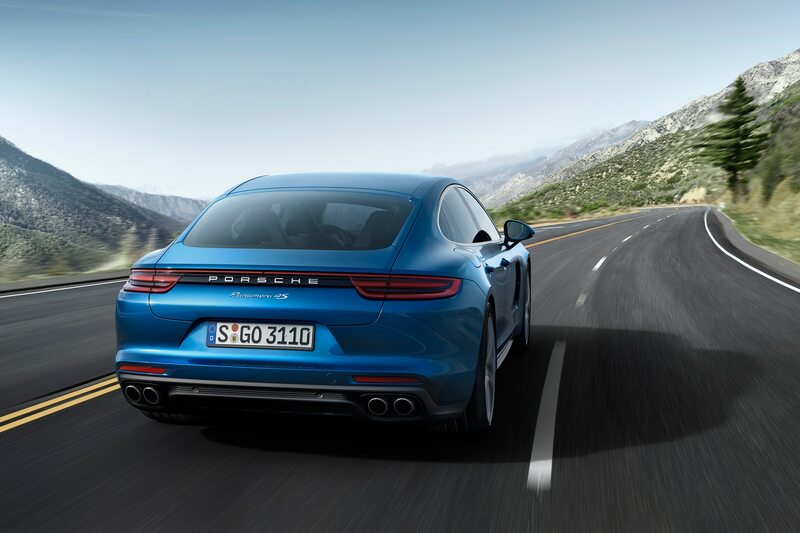 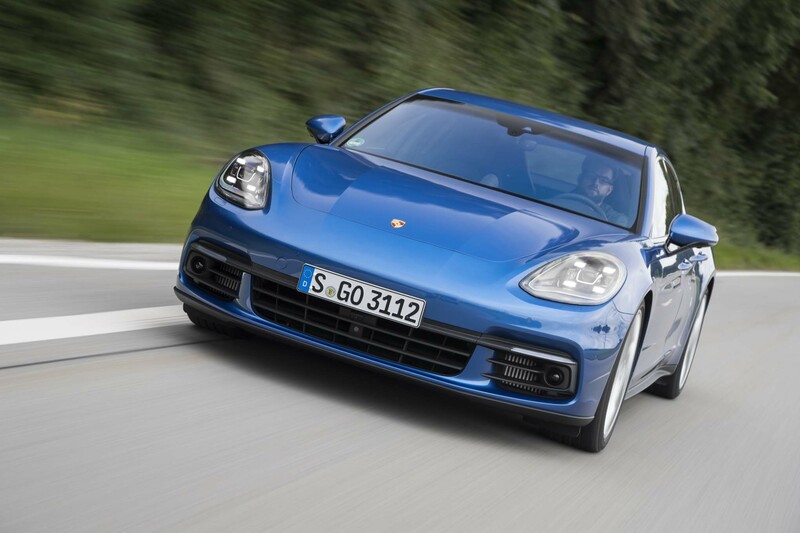 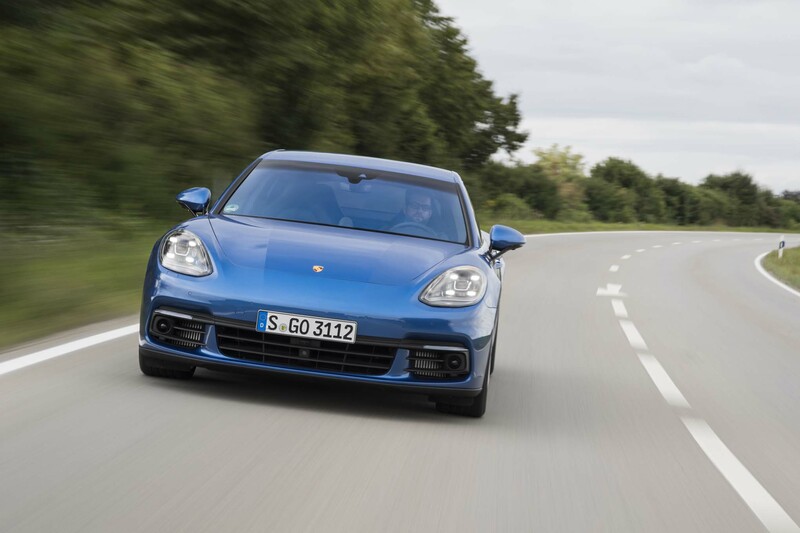 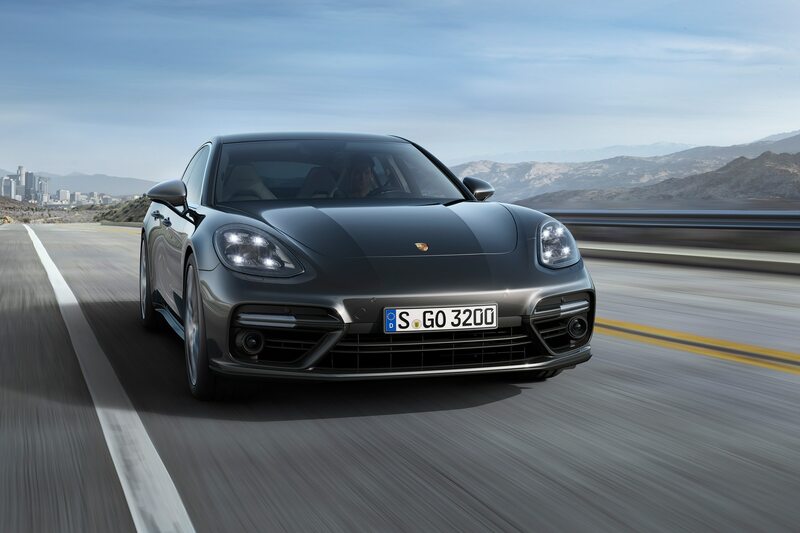 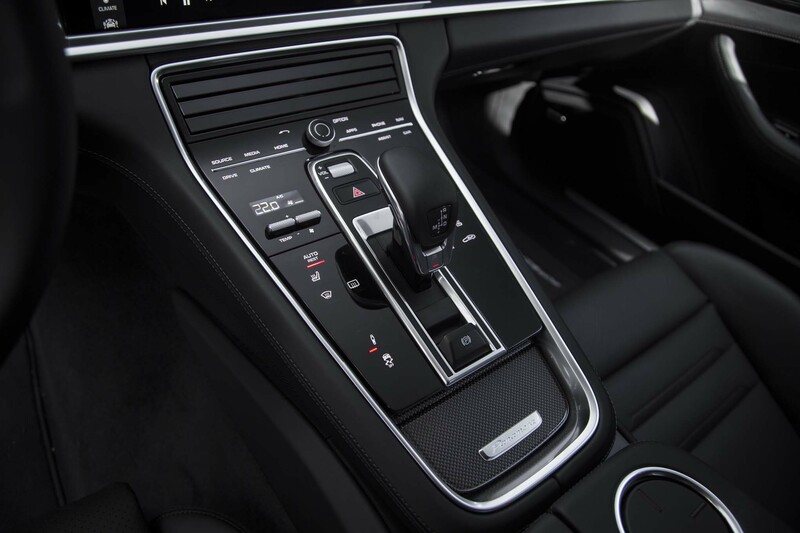 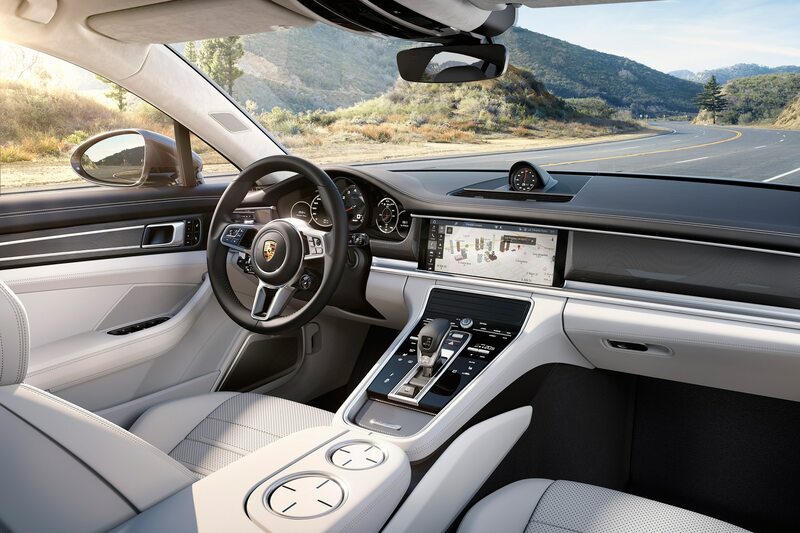 The engine is very polished in concert with Porsche’s eight-speed dual-clutch automatic transmission, which helps the 4S dig out a healthy 4.0-second sprint from 0 to 60 mph with the optional Sport Chrono package, on its way to a top speed of 179 mph. 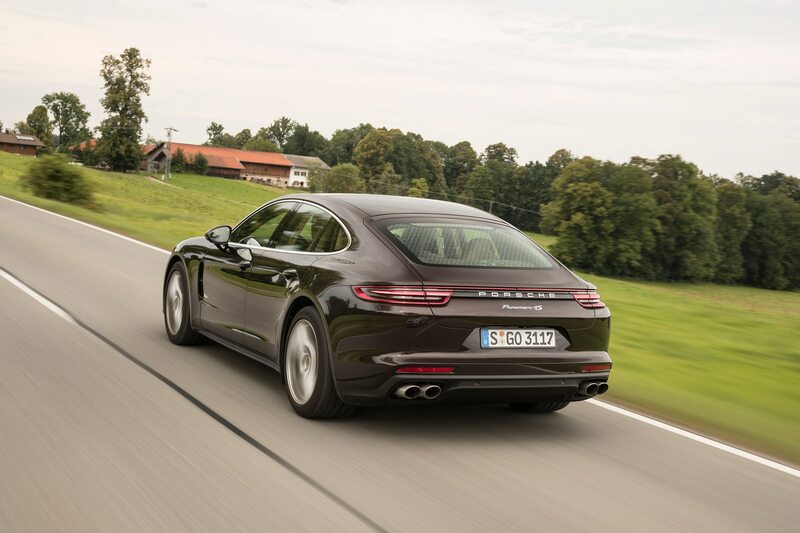 I most enjoyed the engine’s flexible and versatile performance. 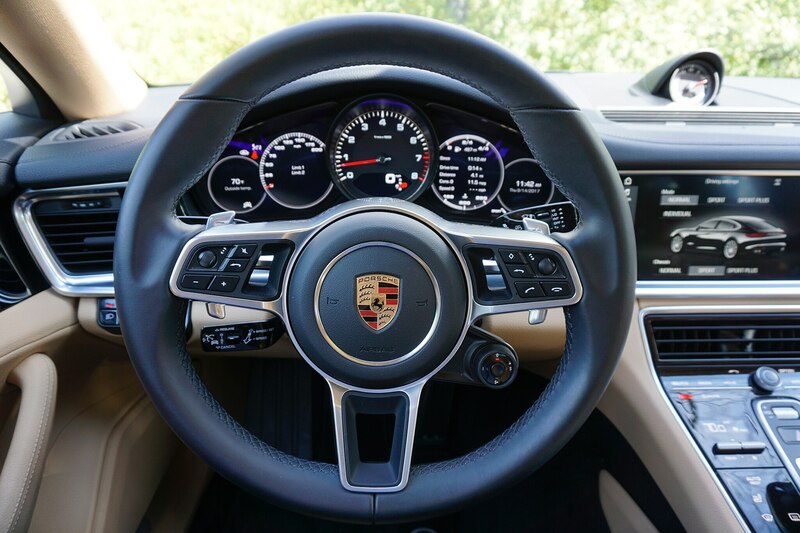 Select your drive mode using the 918-derived steering-wheel dial, offering up Normal, Sport, Sport+, or Individual modes. 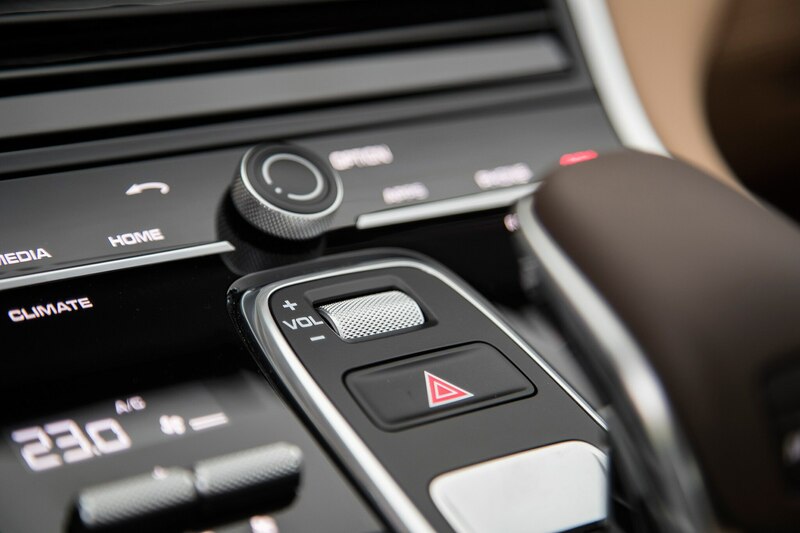 Normal is far from a bore, and shy of a somewhat delayed throttle response, it’s the wisest choice for daily driving. 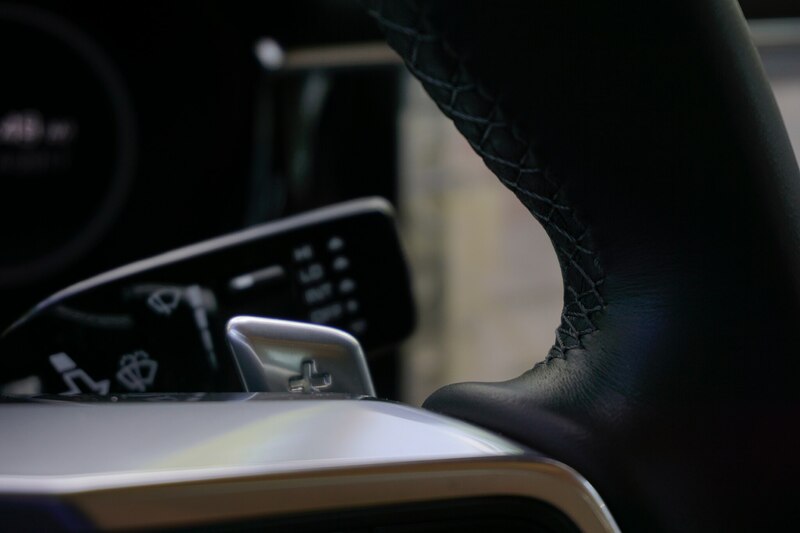 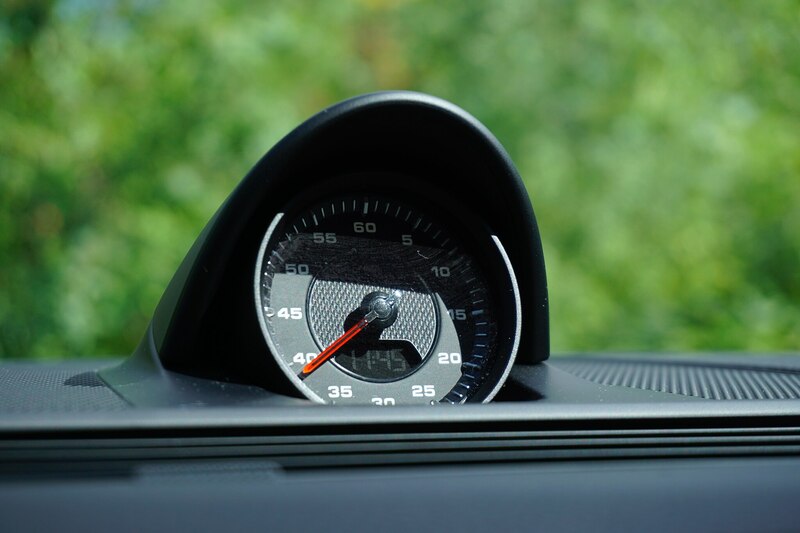 Should the need to suddenly pass a slow-moving Ford Transit Connect arise, simply press into the drive-mode selector on the steering wheel for 20 seconds of faster throttle and steering response, eliminating the need to be constantly switching between modes. 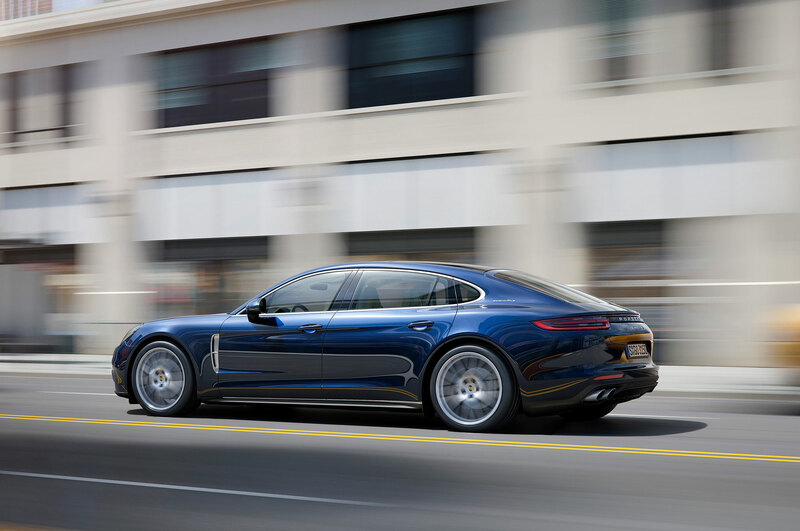 With the $6,930 Sport package, alongside rear-axle steering, Sport Chrono, and a Sport exhaust, comes an adaptive air suspension with three chambers at each wheel. 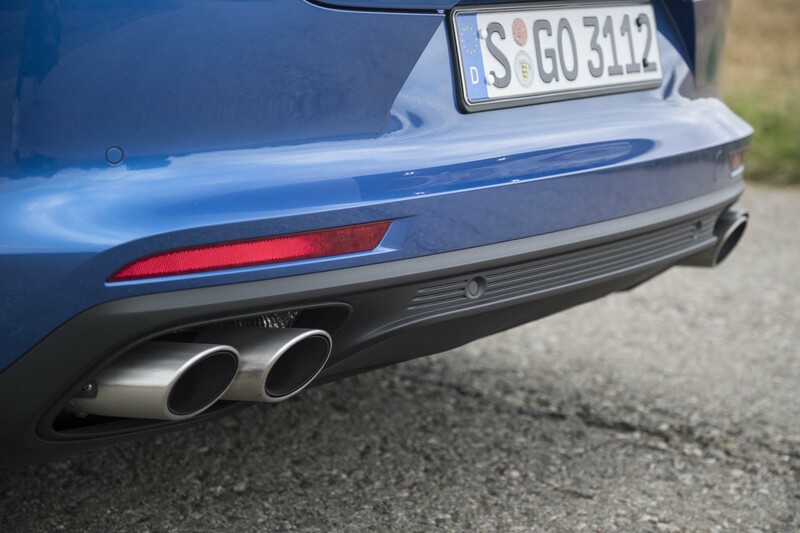 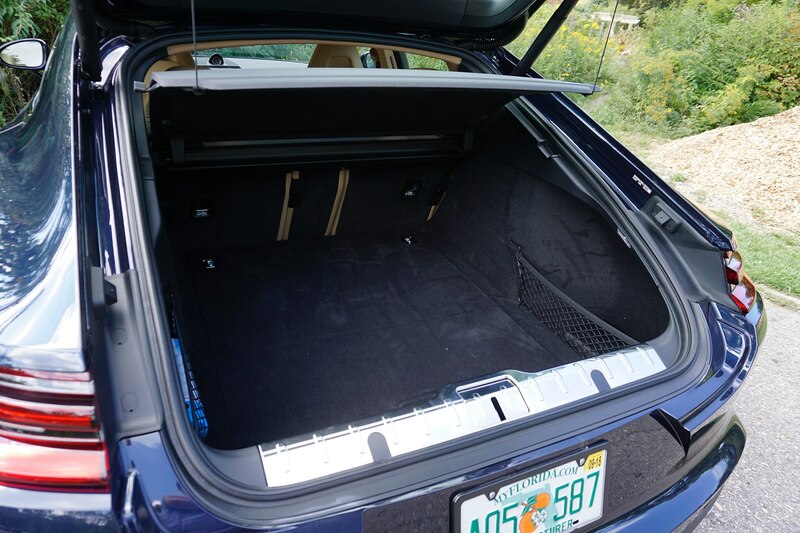 Fewer chambers with air means a stiffer suspension, varying between Normal, Sport, and Sport+. 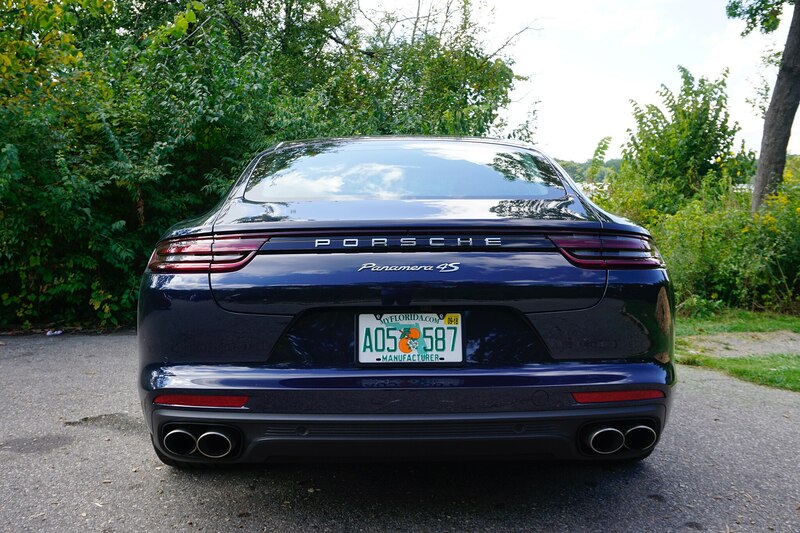 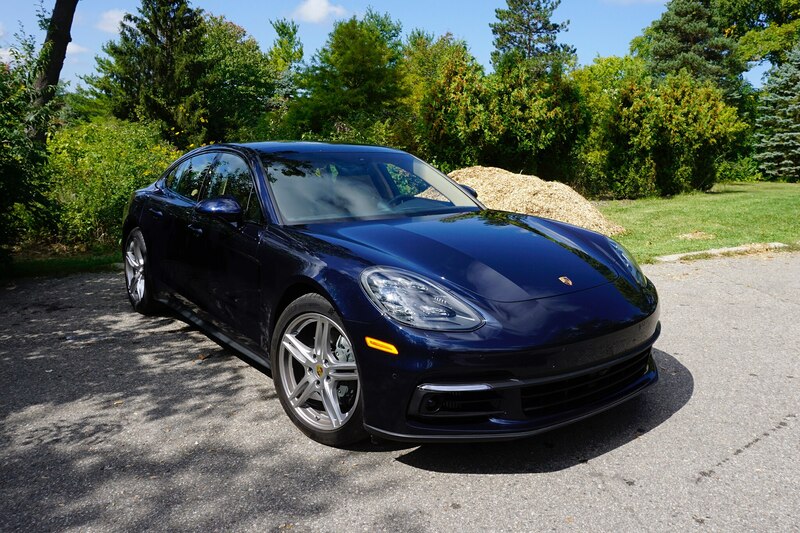 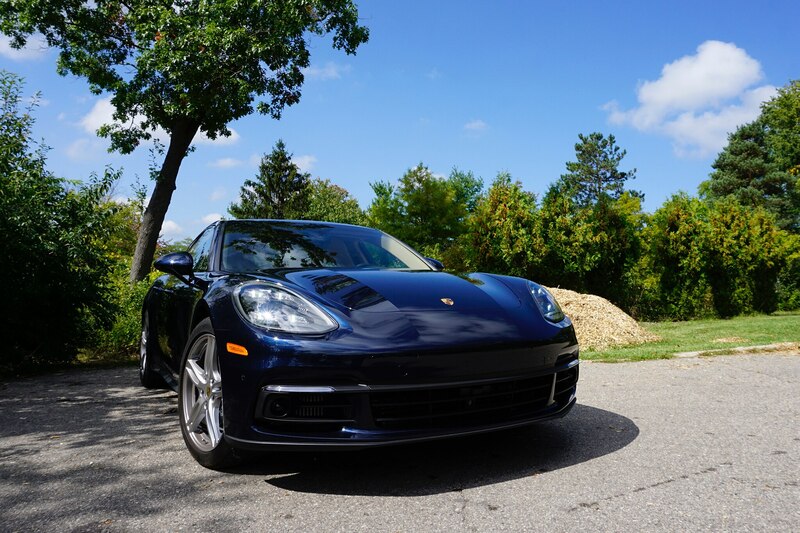 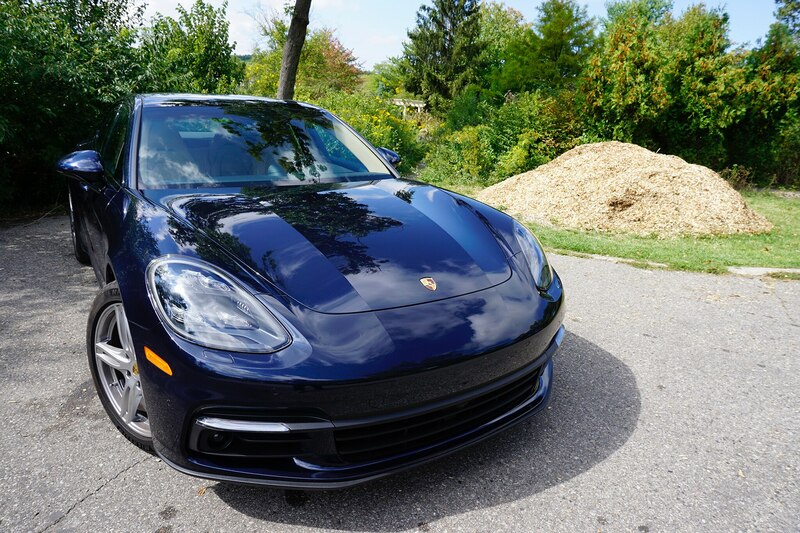 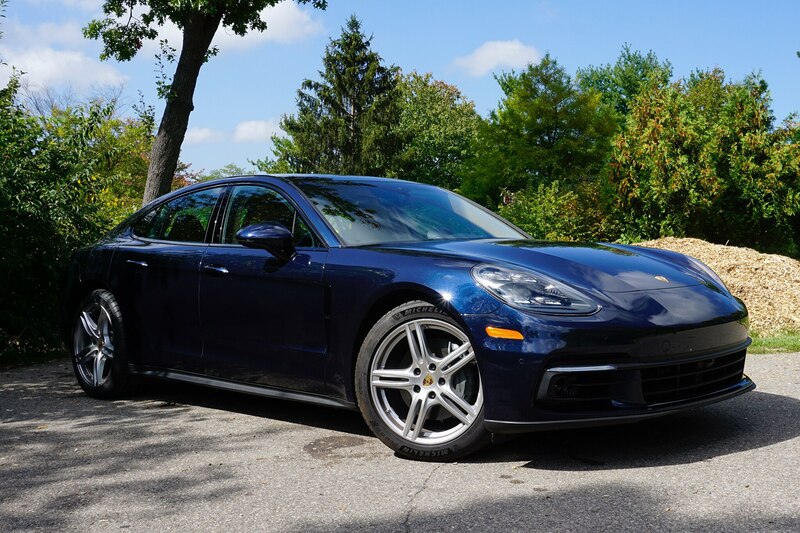 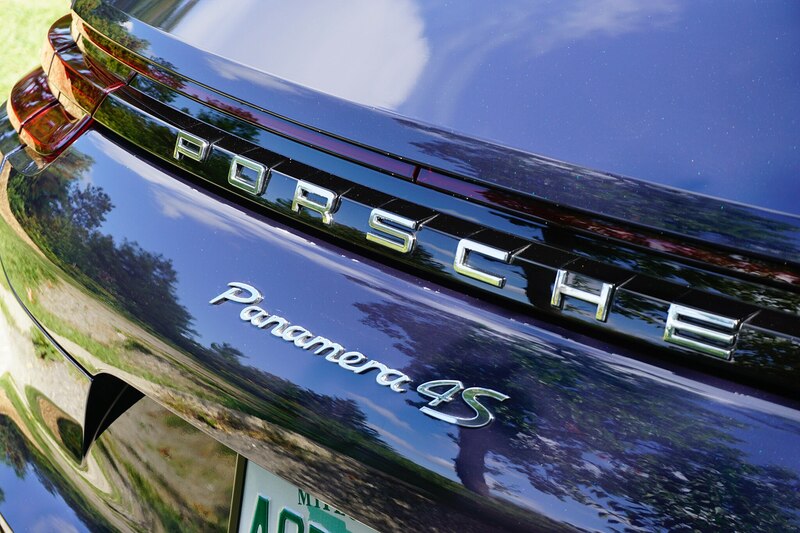 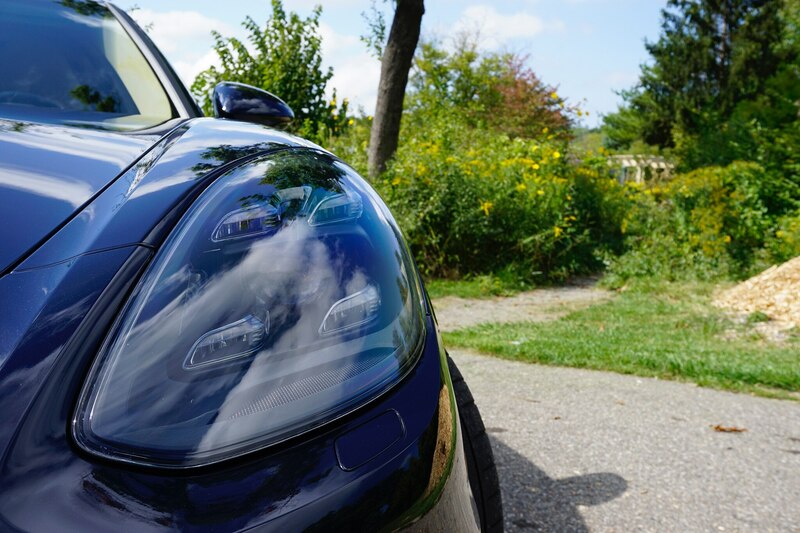 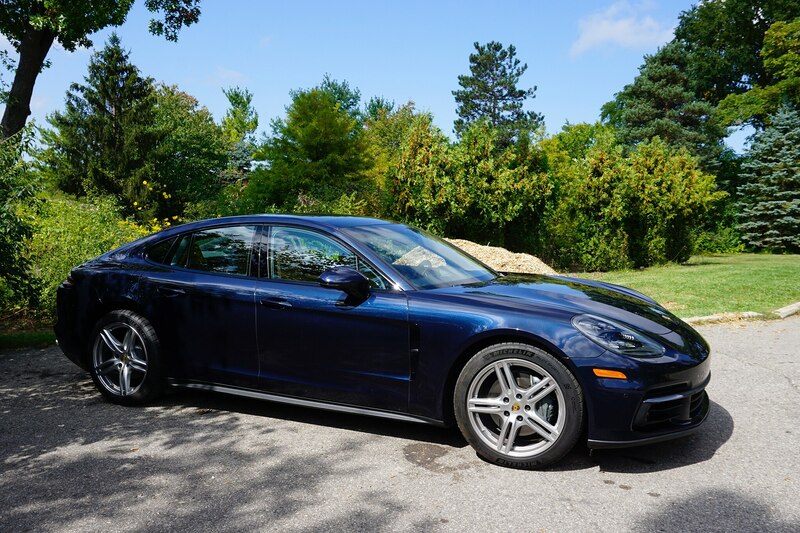 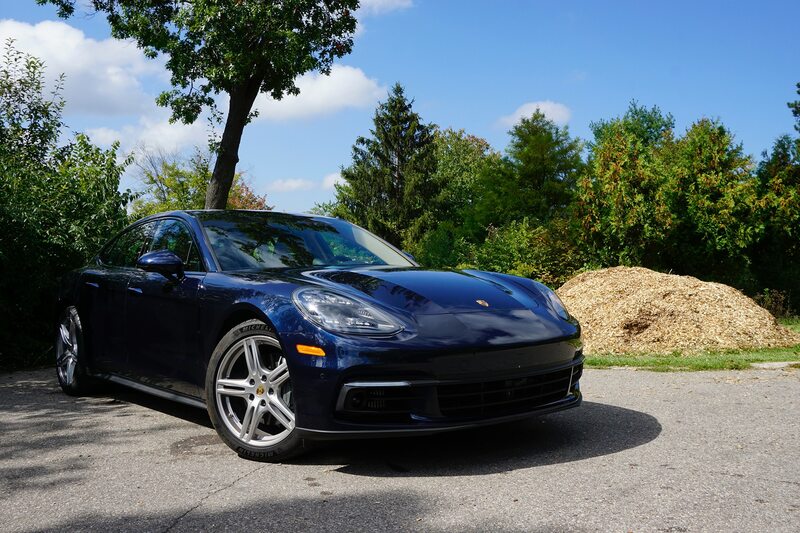 Even in Normal, though, the Panamera feels totally planted, and in the very rigid Sport+, the ride is neither harsh nor jarring over terrible metro Detroit roads. 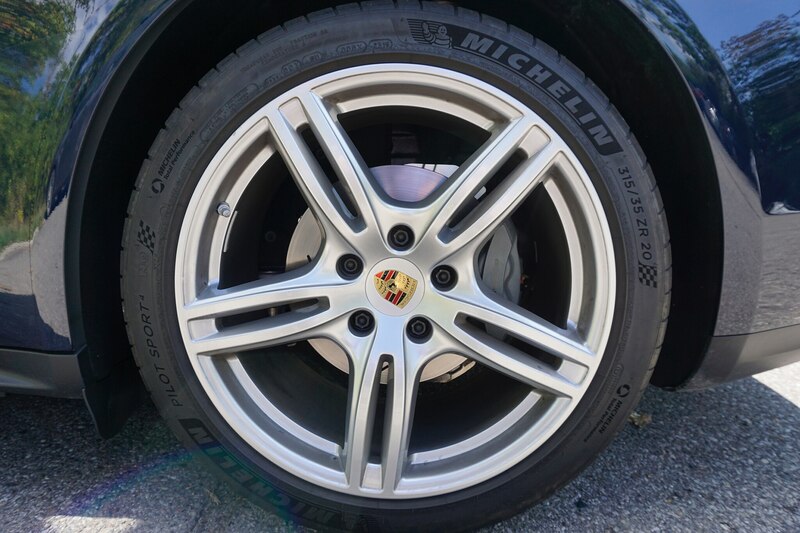 Brakes are extremely quick to react to inputs, which is fantastic at speed, but somewhat hyperactive and touchy in the parking lot. 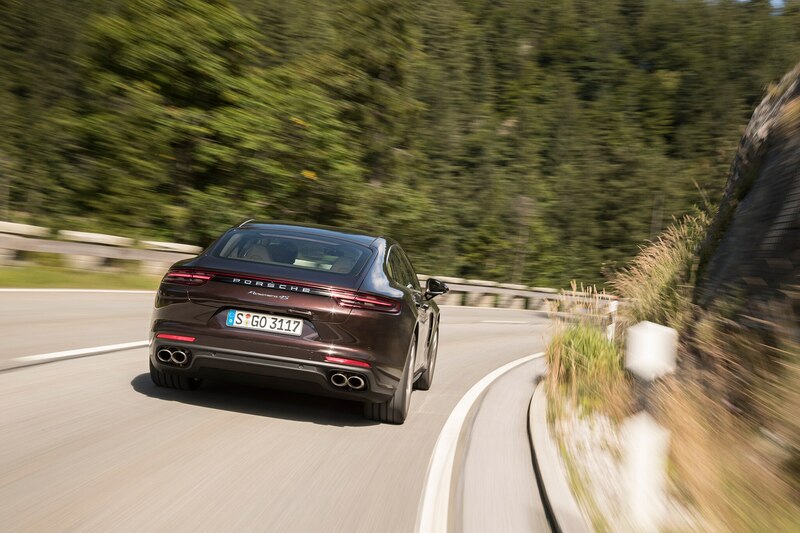 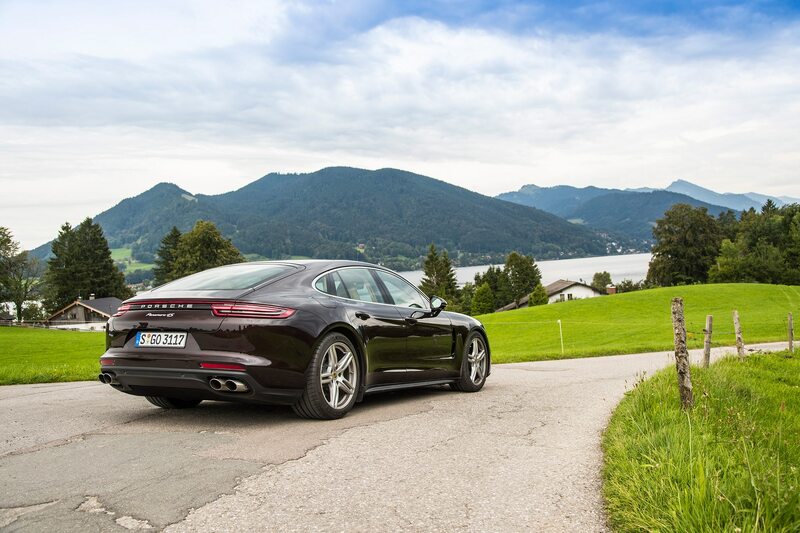 This is far and away the best Panamera yet, and its faults are few. 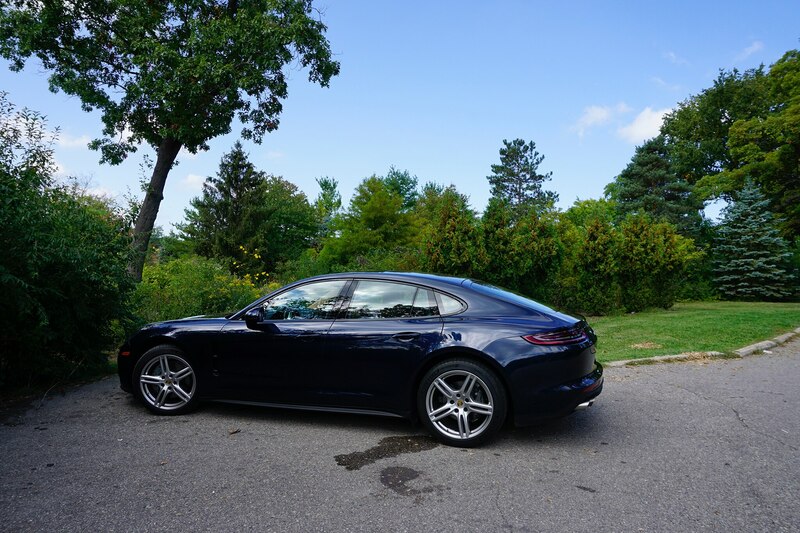 It tops the BMW 7 Series in just about every way I can think of, and while not quite as supple and lovely to bask in as the S-Class, Porsche’s driver-focused approach and sporty chassis tune put it in its own category entirely. 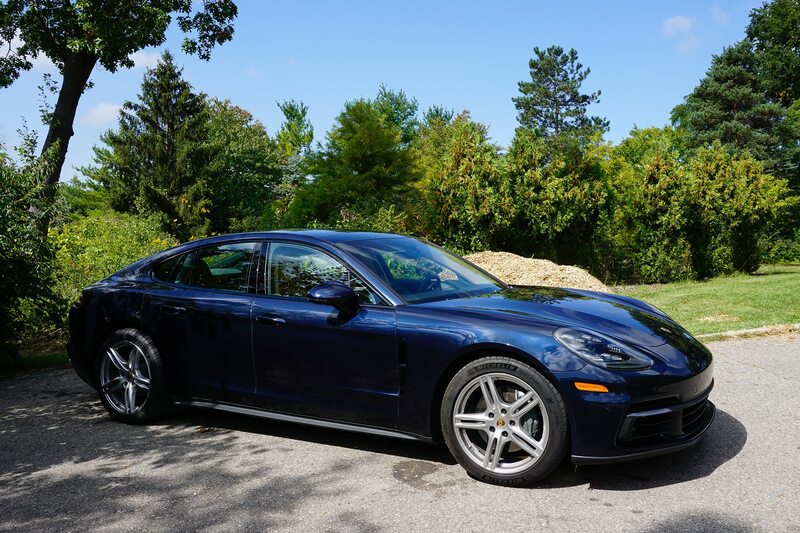 $133,185 is a lot of scratch, no doubt, but I can’t say my week with the Panamera 4S made me feel like this ugly duckling made pretty is anything but worth every penny.